You are cordially invited to attend the 2019 Annual Meeting of Shareholders (“2019 Annual Meeting”) of The Manitowoc Company, Inc. (the “Company”) which will be held at Hilton Garden Inn Milwaukee Park Place, located at 11600 W. Park Place, Milwaukee, Wisconsin 53224, on Tuesday, May 7, 2019, at 9:00 a.m. Central Daylight Time. Such other business as may properly come before the 2019 Annual Meeting. FOR approval of the compensation of the Company’s named executive officers, as disclosed in the Compensation Discussion and Analysis and the Executive Compensation sections of the Proxy Statement. Whether or not you are able to attend the 2019 Annual Meeting, we welcome your questions and comments about the Company. To make the best use of time at the meeting, we would appreciate receiving your questions or comments, in writing, in advance of the meeting, so they can be answered as completely as possible at the meeting. If you wish to make a comment or ask a question in writing, we would appreciate receiving it by April 27, 2019. Please send to the attention of our Secretary. It is important that your shares be represented and voted at the meeting. You should have already received an Important Notice Regarding the Availability of Proxy Materials for the Shareholder Meeting with instructions on how to access the Proxy Materials and vote. As indicated in that Notice, you may view the Proxy Materials online at www.proxyvote.com and you may also access and complete the proxy card online at www.proxyvote.com. Or if you prefer, you may request a copy of the Proxy Materials, free of charge, including a hard copy of the proxy card, through the website www.proxyvote.com, by phone at 1-800-579-1639 or by email at sendmaterial@proxyvote.com. To help us plan for the meeting, please mark your proxy card telling us if you will be attending in person. 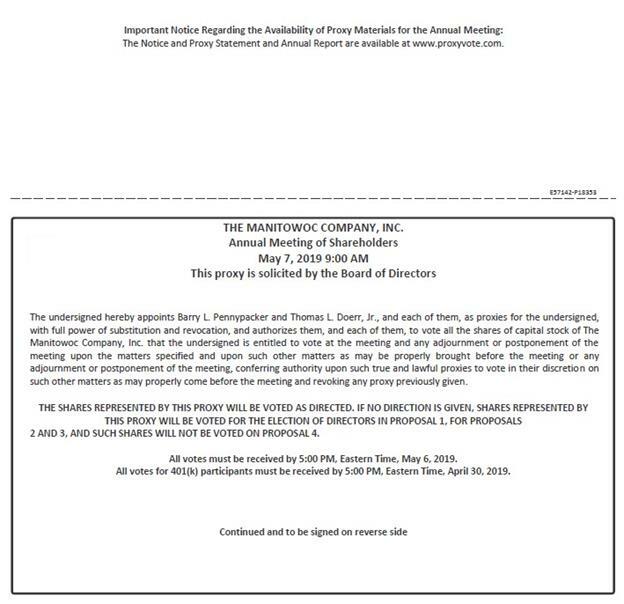 Important Notice Regarding the Availability of Proxy Materials for the 2019 Annual Meeting of Shareholders of The Manitowoc Company, Inc. to be held on Tuesday, May 7, 2019. We encourage you to access and review all of the information contained in the Proxy Statement and accompanying materials before voting. The Proxy Statement and the Company’s Annual Report are available at www.proxyvote.com. If you want to receive a paper or email copy of these documents, you must request one. There is no charge to you for requesting a copy. Please make your request for a copy as instructed below on or before April 23, 2019 to facilitate timely delivery. To the Shareholders of The Manitowoc Company, Inc.
To transact such other business as may properly come before the 2019 Annual Meeting. Shareholders of record as of the close of business on March 6, 2019 are cordially invited to attend and are entitled to vote at the 2019 Annual Meeting. However, whether or not you expect to attend the 2019 Annual Meeting in person, you are requested to properly complete the proxy card online at www.proxyvote.com or to obtain, complete, date, sign, and promptly return a hard copy of the proxy card, which can be obtained by request through the website, toll free number or email address noted above. This Proxy Statement is furnished by the Board of Directors (the “Board of Directors” or “Board”) of The Manitowoc Company, Inc., a Wisconsin corporation (referred to in this Proxy Statement as the “Company,” “we” or “our”), to the shareholders of the Company in connection with a solicitation of proxies for use at the 2019 Annual Meeting of Shareholders (the “2019 Annual Meeting”) to be held at 9:00 a.m., Central Daylight Time, on Tuesday, May 7, 2019, at Hilton Garden Inn Milwaukee Park Place, located at 11600 W. Park Place, Milwaukee, Wisconsin 53224, and at any and all adjournments or postponements thereof. This Proxy Statement and the accompanying materials are being provided to shareholders on or about March 28, 2019. On March 6, 2019, the record date for determining shareholders entitled to vote at the 2019 Annual Meeting, there were outstanding 35,648,526 shares of Company common stock, par value $0.01 per share (the “Common Stock”). Each share outstanding on the record date is entitled to one vote on all matters presented at the meeting. Any shareholder entitled to vote may vote in person or by duly executed proxy. Shareholders of record will have the option to vote by written proxy or electronically via either the internet or telephone. Instructions on how to vote are set forth in the Proxy Materials sent to shareholders. Shareholders may access and complete the proxy card online at www.proxyvote.com. In order to vote online, a shareholder will need the control number provided to the shareholder along with the Notice of Meeting. The Company is offering electronic services both as a convenience to its shareholders and as a step towards reducing costs. Shareholders not wishing to use electronic voting methods may continue to cast votes by returning their signed and dated proxy card. All Proxy Materials for the 2019 Annual Meeting, including this Proxy Statement and the 2019 Annual Report to Shareholders, are available on the internet at www.proxyvote.com. All shareholders have been separately provided an “Important Notice Regarding the Availability of Proxy Materials.” As indicated in that Notice, if you want to receive a paper or email copy of these documents, you must request one. There is no charge to you for requesting a copy. Please make your request as instructed in that Notice on or before April 23, 2019 to facilitate timely delivery. A proxy may be revoked at any time before it is exercised by filing a written notice of revocation with the Secretary of the Company, by delivering a duly executed proxy bearing a later date, or by voting in person at the 2019 Annual Meeting. Attendance at the 2019 Annual Meeting will not in itself constitute revocation of a proxy. The shares represented by all properly executed unrevoked proxies received in time for the 2019 Annual Meeting will be voted as specified on the proxies. Shares held for the accounts of participants in the Company’s Dividend Reinvestment Plan and The Manitowoc Company, Inc. 401(k) Retirement Plan (for which the proxies will serve as voting instructions for the shares) will be voted in accordance with the instructions of participants or otherwise in accordance with the terms of those Plans. If no direction is given on a properly executed unrevoked proxy, it will be voted FOR each of the eight director nominees, FOR ratification of the appointment of PricewaterhouseCoopers LLP as the Company’s independent registered public accounting firm for the fiscal year ending December 31, 2019, and FOR approval of the compensation of the Company’s named executive officers, as disclosed in the Compensation Discussion and Analysis and the Executive Compensation sections of this Proxy Statement. If no direction is given on a properly executed unrevoked proxy, it will not be voted on the proposed amendment to the Company’s Articles of Incorporation. also may be made by email, telephone, facsimile, or other means of communication by certain directors, officers, employees, and agents of the Company. The directors, officers, and employees will receive no compensation for these proxy solicitation efforts in addition to their regular compensation, but may be reimbursed for reasonable out-of-pocket expenses in connection with the solicitation. The Company will request persons holding shares in their names for the benefit of others or in the names of their nominees to send Proxy Materials to and obtain proxies from their principals and will reimburse such persons for their expenses in so doing. To be effective, a matter presented for a vote of shareholders at the 2019 Annual Meeting must be acted upon by a quorum (i.e., a majority of the votes entitled to be cast represented at the 2019 Annual Meeting in person or by proxy). Abstentions, shares for which authority is withheld to vote for director nominees, and broker non-votes (i.e., proxies from brokers or nominees indicating that such persons have not received instructions from the beneficial owners or other persons entitled to vote shares as to a matter with respect to which the brokers or nominees do not have discretionary power to vote) will be considered present for the purpose of establishing a quorum. Once a share is represented at the 2019 Annual Meeting, it is deemed present for quorum purposes throughout the meeting or any adjourned or postponed meeting, unless a new record date is or must be set for any adjourned or postponed meeting. We remind you that your broker may not vote your shares in its discretion in the election of directors (Proposal 1); therefore, you must vote your shares if you want them to be counted in the election of directors. In addition, your broker is also not permitted to vote your shares in its discretion regarding matters relating to executive compensation (Proposal 3) or the proposed amendment to the Company’s Articles of Incorporation (Proposal 4). However, your broker may vote your shares in its discretion on routine matters such as the ratification of the Company’s independent registered public accounting firm (Proposal 2). Proposal 1: Election of Directors. Directors are elected by a majority of the votes cast by the holders of shares entitled to vote in the election at a meeting at which a quorum is present, assuming the election is uncontested (a plurality voting standard applies in contested elections). For this purpose, a majority of votes cast means that the number of votes cast “for” a director’s election must exceed the number of votes cast “withheld” with respect to that director’s election. Any shares not voted (whether by broker non-vote or otherwise) will have no effect on the election of directors. Pursuant to the Company’s Restated By-laws, any nominee who receives fewer votes cast “for” his or her election than votes cast “withheld” is required to promptly tender his or her resignation to the Chair of the Board following certification of the shareholder vote. The Corporate Governance Committee of the Board of Directors will promptly consider the resignation, and make a recommendation to the Board of Directors as to whether to accept or reject such resignation. Proposal 2: Ratification of the appointment of PricewaterhouseCoopers LLP as the Company’s independent registered public accounting firm for the fiscal year ending December 31, 2019. The affirmative vote of a majority of the votes cast on the proposal by the holders of shares entitled to vote at the meeting at which a quorum is present is required for ratification of PricewaterhouseCoopers LLP as the Company’s independent registered public accounting firm for the fiscal year ending December 31, 2019. Any shares not voted (whether by broker non-vote or otherwise, except abstentions) have no impact on the vote. Shares of Common Stock as to which holders of shares abstain from voting will be treated as votes against ratification. Proposal 3: Advisory vote to approve the compensation of the Company’s named executive officers. The affirmative vote of a majority of the votes cast on the proposal (assuming a quorum is present) is required to approve the advisory vote on the compensation of the Company’s named executive officers, as disclosed in the Compensation Discussion and Analysis and the Executive Compensation sections of this Proxy Statement. Abstentions and broker non-votes will not be included in the votes cast and thus will have no effect other than not providing the Company with your view on the proposal. Although the outcome of this advisory vote is not binding on the Company, the Compensation Committee and the Board of Directors will review and consider the outcome of the vote when making future compensation decisions pertaining to the Company’s named executive officers. gain approval. Abstentions and broker non-votes will not be included in the votes cast and thus will have no effect other than not providing the Company with your view on the proposal. The Board of Directors recommends a vote: “FOR” the election of the eight directors named in proposal 1; “FOR” the ratification of the appointment of PricewaterhouseCoopers LLP as the Company’s independent registered public accounting firm; and “FOR” approval of the compensation of the Company’s named executive officers. All eight of the Company’s directors are to be elected at the 2019 Annual Meeting. The nominees to the Board are Ms. Cooney and Messrs. Armes, Bohn, Condon, Krueger, Myers, Pennypacker and Pfeifer, all of whom are currently directors. Information regarding each nominee is set forth below. If elected, each individual will hold office for a one-year term expiring at the 2020 Annual Meeting of Shareholders, subject to the limit discussed in the following sentence, or until their respective successors are duly elected and qualified. Pursuant to the Company’s Corporate Governance Guidelines, when a director reaches the age of 72, the director will resign from the Board at the first annual meeting held after reaching that age. The election of directors is determined by a majority of the votes cast, if the election is uncontested. Shares represented by proxies in the accompanying form will be voted for the election of the nominees listed below, unless a contrary direction is indicated. The nominees have indicated that they are able and willing to serve as directors. However, if any of the nominees should be unable to serve, which management does not contemplate, it is intended that the proxies will vote for the election of such other person or persons as management may recommend. The following sets forth certain information, as of March 6, 2019, about the Board’s nominees for election at the 2019 Annual Meeting. All eight nominees were recommended to the Board by the Corporate Governance Committee. Roy V. Armes, 66, has been a director of the Company since 2018 and serves on the Company’s Corporate Governance and Compensation Committees. He was previously a director of the Company from 2010 to 2016. He is the former Executive Chairman, President and CEO of Cooper Tire and Rubber Company from 2007 to 2016. He held various executive positions with Whirlpool Corporation from 1975 to 2006 including Senior Vice President, Project Management Office; Corporate Vice President and General Director, Whirlpool Mexico; Corporate Vice President, Global Procurement Operations; President/Managing Director, Whirlpool Greater China, Inc. Hong Kong; Vice President, Manufacturing Technology, Whirlpool Asia (Singapore); and Vice President, Manufacturing & Technology, Refrigeration Products, Whirlpool Europe (Comerio, Italy). He has been a director of AGCO Corporation since 2013 and currently serves on the Compensation Committee and Succession Planning Committee of AGCO. Mr. Armes’s significant senior management experience at two global manufacturing companies and extensive experience in engineering, manufacturing, technology, global procurement, sales and marketing and international operations management make him qualified to serve on the Company’s Board of Directors. Robert G. Bohn, 65, has been a director of the Company since 2014 and serves on the Company’s Corporate Governance Committee as Chair and on the Audit Committee. He served as Chief Executive Officer of Oshkosh Corporation, a leading manufacturer of access equipment, specialty vehicles, and truck bodies for the primary markets of defense, concrete placement, refuse collection, and fire and emergency vehicles, from 1997 until 2010, and as its Chair of the Board from 2000 to 2011. Mr. Bohn joined Oshkosh Corporation in 1992 as Group Vice President, and also served as its President from 1994 to 2007 and as its Chief Operating Officer from 1994 to 1997. Prior to joining Oshkosh Corporation, he held various executive positions with Johnson Controls, Inc. from 1985 to 1992. He also serves as a director of Carlisle Companies Inc., Parker Hannifin Corporation and Menasha Corporation. Mr. Bohn’s extensive experience in growth strategy development and execution, international market development, acquisitions integration, and maximizing operational efficiency make him qualified to serve on the Company’s Board of Directors. Donald M. Condon, Jr., 69, has been a director of the Company since 2010 and serves on the Company’s Compensation Committee as Chair and on the Audit Committee. Mr. Condon is President (2012 to present) of IDSM Distribution Services, Inc., a family-owned company providing distribution services. He also serves as a director and Chief Development Officer of Continental Carbon Company, an affiliate of China Synthetic Rubber Company and Taiwan Cement Corporation, which are public companies. Mr. Condon previously served as Senior Vice President (2006-2012) of Olefins and Corporate Business Development for Westlake Chemical Corporation, an owner and operator of facilities for the manufacture of petrochemicals, plastics and fabricated plastic products. Prior to joining Westlake, Mr. Condon held executive positions in the petrochemical, plastics, oil and gas, and industrial fabrication business with Titan Chemicals Corp. Bhd. (2003-2006), Conoco (1993-2003), and E.I. DuPont De Nemours (1974-1993). While at Titan Chemicals, Mr. Condon was Managing Director and Chief Executive Officer, and he led the company when it went public on the Malaysian Stock Exchange (Bursa Malaysia) and the NYSE in 2005, and continued to serve as a director until 2010. Mr. Condon also serves as Chair of the Advisory Board of the Nicholas Center for Finance at the University of Wisconsin-Madison, Director of re:MIND (formerly the Depression and Bipolar Support Alliance of Greater Houston), and is a National Association of Corporate Directors (“NACD”) Board Leadership Fellow, NACD’s highest accreditation for boardroom leadership. Mr. Condon’s more than 40 years of senior executive and board experience in management, finance, operations, strategy and corporate development in the chemical, industrial and energy industries make him a valuable contributor to the Company’s Board of Directors. Anne M. Cooney, 59, has been a director of the Company since 2016 and serves as a member of the Company’s Audit and Compensation Committees. She served as President, Process Industries and Drives of Siemens Industry, Inc., a division of Siemens AG, a multinational conglomerate primarily engaged in industrial engineering, electronics, energy, healthcare and infrastructure activities, from 2014 to her retirement in December 2018. Ms. Cooney joined Siemens in 2001 and held a variety of high-level management positions, including serving as Chief Operating Officer, Siemens Healthcare Diagnostics, a division of Siemens AG, from 2011 until 2014, and as President, Drives Technologies of Siemens Industry, Inc. from 2008 until 2011. She previously held various positions with increasing responsibility at General Electric Company and also served as Vice President, Manufacturing of Aladdin Industries, LLC. Ms. Cooney serves as a director of Summit Materials, Inc. Ms. Cooney earned a B.S. from Gannon University and an M.B.A. from Emory University. Ms. Cooney brings senior management and operational experience to the Company’s Board of Directors. Her extensive background and leadership experience in various segments of large manufacturing companies make her qualified to serve on the Company’s Board of Directors. Kenneth W. Krueger, 62, has been a director of the Company since 2004, currently serves as the Board Chair and served as the interim President and Chief Executive Officer of the Company from October 2015 until March 2016. Mr. Krueger was the Chief Operating Officer (2006 to 2009) and Executive Vice President (2005 to 2006) of Bucyrus International, Inc., a global leader in mining equipment manufacturing. Mr. Krueger also was the Sr. Vice President and Chief Financial Officer (2000 to 2005) of A. O. Smith Corporation, a global manufacturer of water heating and water treatment systems, and Vice President, Finance and Planning, Hydraulics, Semiconductor Equipment and Specialty Controls Group (1999 to 2000) of Eaton Corporation. Mr. Krueger also serves as a director of Douglas Dynamics, Inc. and Albany International Corporation. Mr. Krueger has extensive financial, accounting and operations experience. He has served as a chief financial officer and chief operating officer of publicly-traded companies and has other significant senior management experience. His experience and background in finance and accounting in a publicly-traded manufacturing company bring great focus to the Company’s accounting, auditing and internal controls. Mr. Krueger’s operations leadership experience in the heavy manufacturing industry, coupled with his experience in accounting and finance, make him a valued adviser as a member of the Company’s Board of Directors and as the current Chair. C. David Myers, 55, has been a director of the Company since 2016 and serves as the Chair of the Company’s Audit Committee. He is retired as President – Building Efficiency of Johnson Controls, Inc., a global diversified technology and industrial company, in 2014 after serving in such role since 2005. Mr. Myers previously served as President and Chief Executive Officer, as well as a director, of York International Corporation, a provider of heating, ventilating, air conditioning, and refrigeration products and services, from 2004 until York was acquired by Johnson Controls in 2005. Prior thereto, he held other positions with increasing responsibility at York, including serving as Executive Vice President and Chief Financial Officer. Mr. Myers previously served as a Senior Manager at KPMG LLP. Mr. Myers serves as a director of The Boler Company (operating as Hendrickson International). Mr. Myers earned a B.S. from Pennsylvania State University. Mr. Myers brings senior management, accounting, and financial controls experience to the Company’s Board of Directors. The foundation of Mr. Myers’ financial controls and accounting expertise is from when he served as a senior manager at KPMG and continued through his service as Chief Financial Officer of York. His background and experience in finance, accounting, and senior management in various segments of large manufacturing companies make him qualified to serve on the Company’s Board of Directors. Barry L. Pennypacker, 58, has served as the Company’s President and Chief Executive Officer since March 2016 after having joined the Company in December 2015 as President and Chief Executive Officer of the Company’s Crane business. Prior to joining the Company, Mr. Pennypacker served as Founder, President, and Chief Executive Officer of Quantum Lean LLC, a privately held manufacturer and supplier of precision components since 2013. Prior to that, he was President, Chief Executive Officer and a director of Gardner Denver, Inc., a manufacturer and marketer of engineered industrial machinery and related parts and services, from 2008 to 2012. Prior to joining Gardner Denver, Mr. Pennypacker served in positions of increasing responsibility at Westinghouse Air Brake Technologies, The Stanley Works and Danaher Corporation. Mr. Pennypacker was originally appointed as a director in 2016 pursuant to the terms of the offer letter he received in connection with joining the Company. Prior to joining the Company, his results-focused leadership style led the transformation of several complex businesses through continuous process improvements as well as delivering significant operational and financial performance improvements. In addition to serving as the Company’s President and Chief Executive Officer, Mr. Pennypacker’s deep industrial expertise, coupled with the successful execution of numerous lean initiatives throughout his career, qualifies him to serve on the Company’s Board of Directors, and Mr. Pennypacker provides the Board with skillful leadership and insight. John C. Pfeifer, 53, has been a director of the Company since 2016 and serves as a member of the Company’s Compensation and Corporate Governance Committees. He is currently Senior Vice President of the Brunswick Corporation, and has served as President of Mercury Marine, a subsidiary of the Brunswick Corporation, since 2014. Mercury Marine is a multibillion dollar global manufacturer of marine propulsion systems. Mr. Pfeifer previously served as Vice President - Global Operations for Mercury Marine from 2012 until 2014 and as President, Brunswick Marine in EMEA from 2008 until 2012. Prior to joining Brunswick in 2006 as President, Asia Pacific Group, Mr. Pfeifer held various executive level positions with increasing responsibility at ITT Corporation, a diversified manufacturer. Mr. Pfeifer earned a B.A. from the University of Michigan. Mr. Pfeifer has extensive management and operational experience in the international operations of large, diversified manufacturers. His experience in international market development, integration and maximizing operational efficiency make him qualified to serve on the Company’s Board of Directors. The Board of Directors recommends a vote “FOR” the election of each of the eight above nominees. The Audit Committee and the Board of Directors have appointed PricewaterhouseCoopers LLP as the Company’s independent registered public accounting firm for the fiscal year ending December 31, 2019, and ask that the shareholders ratify that appointment. A representative of PricewaterhouseCoopers LLP is expected to be present at the 2019 Annual Meeting to respond to appropriate questions and to make a statement if he or she desires to do so. Although ratification is not required by the Company’s Restated By-laws or otherwise, the Board of Directors is submitting the appointment of PricewaterhouseCoopers LLP as the Company’s independent registered public accounting firm for the fiscal year ending December 31, 2019 to its shareholders for ratification as a matter of good corporate practice and because the Board values the input of its shareholders on this matter. As previously described, a majority of the votes cast on the proposal by the holders of shares entitled to vote at the 2019 Annual Meeting is required for ratification of PricewaterhouseCoopers LLP as the Company’s independent registered public accounting firm for the fiscal year ending December 31, 2019. If the shareholders fail to ratify the appointment of PricewaterhouseCoopers LLP, the Audit Committee will consider it as a direction by shareholders to consider the appointment of a different independent registered public accounting firm. Nevertheless, the Audit Committee will still have the discretion to determine whom to appoint as the Company’s independent registered public accounting firm for the fiscal year ending December 31, 2019. Even if the appointment of PricewaterhouseCoopers LLP is ratified, the Audit Committee, in its discretion, may select a different independent registered public accounting firm at any time during the year if it determines that such a change would be in the best interests of the Company. The Board of Directors recommends a vote “FOR” the ratification of the appointment of PricewaterhouseCoopers LLP as the Company’s independent registered public accounting firm for the fiscal year ending December 31, 2019. RESOLVED, that the compensation paid to the Company’s named executive officers, as disclosed pursuant to Item 402 of Regulation S-K, including the Compensation Discussion and Analysis, compensation tables and narrative discussion, is hereby APPROVED. Although the outcome of this advisory vote is not binding on the Company, the Compensation Committee and the Board of Directors will review and consider the outcome of the vote when making future compensation decisions pertaining to the Company’s named executive officers. In seeking your approval of the compensation of the named executive officers, we direct you to the Compensation Discussion and Analysis section, including its Executive Summary, and the Executive Compensation section. The Board of Directors recommends a vote “FOR” approval of the compensation of the Company’s named executive officers, as disclosed in the Compensation Discussion and Analysis and the Executive Compensation sections of this Proxy Statement. At the 2018 Annual Meeting of Shareholders, shareholders holding a majority of the Company’s outstanding shares voted in favor of a shareholder proposal requesting that the Board of Directors take steps necessary to replace each voting requirement in the Company’s Amended and Restated Articles of Incorporation, as amended (the “Articles”), and Restated Bylaws that requires a greater than simple majority vote standard with a requirement for a majority of the votes cast for and against applicable proposals, or a simple majority vote standard in compliance with applicable laws. As a result, we are seeking shareholder approval to amend Section 4.2 of Article IV of our Articles to provide for a simple majority vote standard. If this proposal is approved by the Company’s shareholders, the Company’s Articles will be amended to provide that a director may be removed from office if the number of votes cast for removal exceed the number of votes against it, assuming a quorum is present, taken at a meeting of shareholders called for that purpose. If this proposal is approved by the Company’s shareholders, the Board of Directors will also amend certain provisions of the Company’s Restated Bylaws to implement a majority voting standard where a greater than majority vote exists. If this proposal is not approved by the Company’s shareholders, the proposed amendment to our Articles will not be made and all existing provisions will remain in effect. A form of the amended Articles, marked to reflect the changes contemplated by this proposal, is attached to this proxy statement as Annex A. This summary of the proposed amendment to the Articles is qualified by its entirety by reference to Annex A. Composition. Currently the Board is comprised of eight directors. Under the Company’s Restated By-laws, the number of directors may not be less than seven or more than twelve. The Board of Directors has determined that the following non-employee directors – Roy V. Armes, Robert G. Bohn, Donald M. Condon, Jr., Anne M. Cooney, Kenneth W. Krueger, C. David Myers and John C. Pfeifer – do not have any material relationships with the Company, other than serving as directors, and that each is independent as defined in the Company’s Director Independence Criteria and under applicable law and the New York Stock Exchange (the “NYSE”) listing standards. In determining whether a director has a material relationship with the Company, the Board has adopted nine Director Independence Criteria which may be viewed on the Company’s website under “Investors – Corporate Governance” at www.manitowoc.com. Any director who meets all of the nine criteria will be presumed by the Board to have no material relationship with the Company. Barry L. Pennypacker, the Company’s President and Chief Executive Officer, is not an independent director. Guidelines and Ethics. The Company has adopted Corporate Governance Guidelines in order to set forth internal Board policies and procedures. The Board of Directors regularly reviews and, if appropriate, revises the Corporate Governance Guidelines and other governance instruments, including the charters of its Audit, Compensation and Corporate Governance Committees, in accordance with rules of the SEC and the NYSE. The Board of Directors has also adopted a Code of Conduct that includes a Global Ethics Policy that pertains to all employees, including, but not limited to, the Company’s principal executive officer, principal financial officer, principal accounting officer and controller. Copies of these documents are available, free of charge, on the Company’s website under “Investors – Corporate Governance” at www.manitowoc.com. As set forth in the Corporate Governance Guidelines, all directors are strongly encouraged to attend the annual shareholder meeting of the Company. All of our directors serving at the time attended the 2018 Annual Meeting of Shareholders. Meetings. During the fiscal year ended December 31, 2018, the Board of Directors met six times. All members of the Board attended at least 75 percent of the meetings held by the Board and the committees on which they served. As required by the Company’s Corporate Governance Guidelines, the Board met in executive session at each regular Board meeting during 2018. Board Leadership Structure. The Board of Directors has determined that the interests of the Company and the Board of Directors are best served at this time by separating the roles of Chair of the Board and Chief Executive Officer of the Company. Among the factors considered by the Board in reaching this conclusion, the Board of Directors believes that it is important for Mr. Pennypacker to focus solely on his responsibilities as President and Chief Executive Officer of the Company and that a Board member with a long-standing familiarity with the Company should serve as the Chair of the Board of Directors. The Corporate Governance Guidelines provide that if the Chair of the Board is not an independent director, the chairperson of the Corporate Governance Committee will serve as the lead director. If for any reason the chairperson of the Corporate Governance Committee is unable to perform the lead director role on a temporary basis, he/she will designate the chairperson of either the Compensation Committee or the Audit Committee to assume the role of lead director on an interim basis. Robert G. Bohn, the chairperson of the Corporate Governance Committee, served as our lead director until March 2019, at which time the Chair of the Board, Kenneth W. Krueger, was deemed to be independent. When a lead director is in place, the lead director has the following duties and responsibilities: (a) preside at all meetings of the Board of Directors at which the Chair of the Board is not present, including independent director sessions; (b) call independent director sessions; (c) serve as a liaison between the Chair of the Board and the independent directors; (d) review and approve the agendas for Board meetings, including the schedule of meetings; (e) meet with the Chair of the Board and Chief Executive Officer after each Board meeting to provide feedback to the Chair of the Board and Chief Executive Officer regarding the Board meeting and any other matters deemed appropriate by the independent directors; and (f) such other duties and responsibilities as the Board of Directors may request from time to time. The Board of Directors is responsible for the oversight of risk across the entire Company. This responsibility is administered more directly through the Audit Committee of the Board of Directors. As set forth in the Audit Committee Charter, one of the responsibilities of the Audit Committee is to assist the Board of Directors in fulfilling its role in the oversight of risk across the organization and the management and/or mitigation of those risks. On a regular basis in its committee meetings, the Audit Committee specifically reviews risk factors identified by management that could have a material adverse effect on the business, financial condition or results of operations of the Company. Additionally, the Audit Committee works to identify the Company’s material risks and risk factors through regular meetings and discussions with senior management, the director of internal audit and the Company’s independent auditors. Management reviews with the Audit Committee the potential risks and mitigating strategies related to each of the Company’s key business areas (i.e., market, financial, operational, reputation, competition, legal and regulatory, environmental, health and safety, product liability, public reporting, information systems, employment and labor, and strategic planning). As specific issues arise and are identified, the Audit Committee reviews with management those issues and the controls that have been put in place, as well as the actions taken to address and mitigate those risks. The management of the risks takes place through the following offices based on responsibility: Chief Financial Officer (market, financial, accounting, information systems, public reporting, reputation, regulatory, and strategic planning risks); General Counsel (legal, regulatory, product liability, and insurance risks); Senior Vice President of Human Resources (employment, labor, regulatory, environmental, health, welfare and safety risks); and the Executive Vice President, Cranes (market, operational, and competition risks). a “related person transaction” generally means a transaction (including any indebtedness or a guarantee of indebtedness) in which we were or are to be a participant and the amount involved exceeds $120,000, and in which a related person had or will have a direct or indirect material interest. Each executive officer, director or nominee for director is required to disclose to the Audit Committee certain information relating to related person transactions for review and approval or ratification by the Audit Committee. The Audit Committee is required to disclose any material related person transactions to the full Board of Directors. Disclosure to the Audit Committee is required to be made before, if possible, or as soon as practicable after the related person transaction is effected, but in any event as soon as practicable after the executive officer, director or nominee for director becomes aware of the transaction or of a material change to such a transaction. Under the policy, the Audit Committee’s decision to approve or ratify a related person transaction is to be based on the Audit Committee’s determination that consummation of the transaction is in, or was not contrary to, the best interests of the Company. There were no reportable transactions with related parties during 2018. The Corporate Governance Committee is also the Company’s nominating committee. The purpose of the Corporate Governance Committee is to assist the Board in its corporate governance responsibilities, including to identify individuals qualified to become Board members, to recommend to the Board for the Board’s selection director nominees and to recommend to the Board the corporate governance principles and guidelines. The Corporate Governance Committee conducts an annual assessment of its own performance and it coordinates the annual evaluation of the Board. All members of the Corporate Governance Committee are independent as defined in the Company’s Director Independence Criteria, applicable law and the corporate governance listing standards of the New York Stock Exchange. The Corporate Governance Committee met four times during 2018. The purpose of the Audit Committee, is to (A) assist the Board of Directors in fulfilling its oversight of (1) the integrity of the Company’s financial statements, (2) the Company’s compliance with legal and regulatory requirements, (3) the independent auditor’s qualifications and independence, (4) the performance of the Company’s internal audit function and independent auditors, (5) the risk across the organization and the management and/or mitigation of those risks, (6) the Company’s compliance with ethical standards established by law, rule, regulation and Company policy, and (7) the Company’s disclosure processes and procedures; and (B) prepare the report that SEC rules require be included in the Company’s annual Proxy Statement. The Audit Committee conducts an annual evaluation of its own performance. All the members of the Audit Committee are “independent,” as defined in the Company’s Director Independence Criteria, the Audit Committee Charter, applicable law and the corporate governance listing standards of the New York Stock Exchange relating to audit committees. The Board has determined that all members of the Audit Committee are financially literate and that Messrs. Myers, Bohn and Condon are “audit committee financial experts,” as defined in the Company’s Audit Committee Charter and in the SEC regulations. The Audit Committee met five times during 2018. For further information, see the Audit Committee Report below. The Compensation Committee provides assistance to the Board of Directors in fulfilling its responsibility to achieve the Company’s purpose of maximizing the long-term total return to shareholders by ensuring that officers, directors and employees are compensated in accordance with the Company’s philosophy, objectives and policies. The Compensation Committee reviews and approves compensation and benefits policies, strategies and pay levels necessary to support corporate objectives and provides an annual report on executive compensation for inclusion in the Company’s annual Proxy Statement, in accordance with applicable rules and regulations. The Compensation Committee conducts an annual evaluation of its own performance. All the members of the Compensation Committee are “independent” as defined in the Company’s Director Independence Criteria, the Compensation Committee Charter, applicable law and the corporate governance listing standards of the New York Stock Exchange relating to compensation committees. The Compensation Committee is primarily responsible for administering the Company’s executive compensation program. As such, the Compensation Committee reviews and approves all elements of the executive compensation program that cover the executive officers. Management is responsible for making recommendations to the Compensation Committee (except with respect to compensation paid to the Chief Executive Officer) and effectively implementing the executive compensation program, as established by the Compensation Committee. To assist the Compensation Committee with its responsibilities regarding the executive compensation program, the Compensation Committee currently retains Willis Towers Watson as its independent compensation consultant. The Compensation Committee considered the factors set forth in the Compensation Committee Charter and in applicable SEC and New York Stock Exchange rules regarding independence, and does not believe that its retention of Willis Towers Watson has given rise to any conflict of interest. Reviewing and recommending the compensation for non-employee directors for vote by the full Board. The Compensation Committee met six times during 2018. For further information, see the Compensation Discussion and Analysis and the Compensation Committee Report below. The Corporate Governance Committee has adopted the following policies and procedures regarding consideration of candidates for the Board. Consideration of Candidates for the Board of Directors Submitted by Shareholders. Pursuant to the Company’s Restated Bylaws and the Corporate Governance Committee Charter, the Corporate Governance Committee will only review recommendations for director nominees from any shareholder beneficially owning, or group of shareholders beneficially owning in the aggregate, at least 5% of the issued and outstanding Common Stock of the Company for at least one year as of the date that the recommendation was made (a “Qualified Shareholder”). Any Qualified Shareholder must submit its recommendation no later than 120 calendar days before the date of the Company’s Proxy Statement is released to the shareholders in connection with the previous year’s annual meeting for the recommendation to be considered by the Corporate Governance Committee. Any recommendation must be submitted in accordance with the policy in the Corporate Governance Guidelines captioned “Communications to the Board of Directors” (which is also described below). In considering any timely-submitted recommendation from a Qualified Shareholder, the Corporate Governance Committee shall have sole discretion as to whether to nominate the individual recommended by the Qualified Shareholder, except that in no event shall a candidate recommended by a Qualified Shareholder who is not “independent” as defined in the Company’s Director Independence Criteria and who does not meet the minimum expectations for a director set forth in the Company’s Corporate Governance Guidelines be recommended for nomination by the Corporate Governance Committee. The Corporate Governance Committee did not receive, prior to the deadline noted above, any recommendations for director nominees from any Qualified Shareholder. Consideration of Candidates for the Board of Directors who are Incumbent Directors. Prior to the expiration of the term of a director desiring to stand for re-election, the Corporate Governance Committee will evaluate the performance and suitability of the particular director. The evaluation may include the opportunity for other sitting directors to provide input to the Corporate Governance Committee or its chairperson and may include an interview of the director being evaluated. If the director being evaluated is the chairperson of the Corporate Governance Committee, another Corporate Governance Committee member will be appointed by the Corporate Governance Committee to lead the evaluation. The Corporate Governance Committee will make a recommendation to the Board for the Board’s final decision on each director seeking re-election. Consideration of Candidates for the Board of Directors who are Non-Incumbent Directors. In the event of a vacancy in the Board of Directors, the Corporate Governance Committee will manage the process of searching for a suitable director. The Corporate Governance Committee will be free to use its judgment in structuring and carrying out the search process based on the Corporate Governance Committee’s and the Board’s perception as to what qualifications would best suit the Board’s needs for each particular vacancy. The process may include the consideration of candidates recommended by officers, Board members, shareholders and/or a third party professional search firm retained by the Corporate Governance Committee. The Corporate Governance Committee has sole authority to retain (including to determine the fees and other retention terms) and terminate any third party to be used to identify director candidates and/or evaluate any director candidates. Any candidate should meet the expectations for directors set forth in the Company’s Corporate Governance Guidelines. Strong preference should be given to candidates who are “independent,” as that term is defined in the Company’s Director Independence Criteria and the New York Stock Exchange rules, and to candidates who are sitting or former executives of companies whose securities are listed on a national securities exchange and registered pursuant to the Securities Exchange Act of 1934. The Corporate Governance Committee is not required to consider candidates recommended by a shareholder except as set forth in the section captioned “Consideration of Candidates for the Board of Directors Submitted by Shareholders” set forth above. If the Corporate Governance Committee determines to consider a candidate recommended by a shareholder, the Committee will be free to use its discretion and judgment as to what deference will be given in considering any such candidate. Director Qualifications and Diversity. The Board of Directors appreciates the value that can come from a diverse representation on the Board of Directors. In identifying candidates for the Board of Directors, the Corporate Governance Committee considers foremost the qualifications and experience that the Corporate Governance Committee believes would best suit the Board’s needs created by each particular vacancy. As part of the process, the Corporate Governance Committee and the Board endeavor to have a Board comprised of individuals with diverse backgrounds, viewpoints, and life and professional experiences, provided such individuals should all have a high level of management and/or financial experience and expertise. In this process, the Board of Directors and the Corporate Governance Committee do not discriminate against any candidate on the basis of race, color, national origin, gender, religion, disability, sexual orientation or gender identity. Such other information that the Company may subsequently request in order to verify the foregoing information or to clarify the communication. Any communication that the Company’s Secretary determines, in his or her discretion, to be or to contain any language that is offensive or to be dangerous, harmful, illegal, illegible, not understandable, or nonsensical, may, at the option of such person, not be forwarded to the Board or any particular director. Any communication from an interested party shall not be entitled to confidential treatment and may be disclosed by the Company or by any Board member as the Company or the Board member sees fit. Neither the Company nor the Board, nor any Board member, shall be obligated to send any reply or response to the interested party, except to indicate to the interested party (but only if the interested party specifically requested such an indication) whether or not the interested party’s communication was forwarded to the Board or the applicable Board member. received the written disclosure and the letter from PricewaterhouseCoopers LLP required by the applicable requirements of the Public Company Accounting Oversight Board, considered whether the provisions of non-audit services by PricewaterhouseCoopers LLP are compatible with maintaining PricewaterhouseCoopers LLP’s independence, and discussed with PricewaterhouseCoopers LLP its independence. Based on the foregoing, the Audit Committee recommended to the Board of Directors that the audited financial statements be included in the Company’s Annual Report on Form 10-K for the fiscal year ended December 31, 2018. Audit fees include fees for services performed to comply with the standards of the Public Company Accounting Oversight Board (United States), including the recurring audit of the Company’s consolidated financial statements. This category also includes fees for audits provided in connection with statutory filings or services that generally only the principal auditor reasonably can provide to a client, such as procedures related to consents and assistance with a review of documents filed with the SEC. Audit related fees include fees associated with assurance and related services that are reasonably related to the performance of the audit or review of the Company’s financial statements. Tax fees primarily include fees associated with tax compliance, tax consulting, and domestic and international tax planning. All other fees primarily include fees associated with an accounting research tool. The Company’s Audit Committee Charter requires that the Audit Committee pre-approve all non-audit services to be performed by the Company’s independent registered public accounting firm. All services performed by PricewaterhouseCoopers LLP that are encompassed in the audit related fees, tax fees, and all other fees were approved by the Audit Committee in advance in accordance with the pre-approval policy set forth in the Audit Committee Charter. In accordance with the recommendation of the Audit Committee, and at the direction of the Board of Directors, the Company has retained PricewaterhouseCoopers LLP as its independent registered public accounting firm for the fiscal year ending December 31, 2019. As set forth in this Proxy Statement, the appointment of PricewaterhouseCoopers LLP is being submitted to the shareholders for ratification at the 2019 Annual Meeting. A representative of PricewaterhouseCoopers LLP is expected to be present at the 2019 Annual Meeting to respond to appropriate questions and to make a statement if he or she desires to do so. The following table sets forth information regarding the beneficial ownership of each person or entity known by the Company to have beneficial ownership of more than 5% of the Company’s outstanding Common Stock. c/o dms Corporate Services, Ltd. This information is based solely on a Schedule 13G/A filed with the SEC on February 14, 2019 by (i) FVP Master Fund, L.P., a Cayman Islands exempted limited partnership (“FVP Master Fund”), (ii) Firefly Value Partners, LP, a Delaware limited partnership (“Firefly Partners”), which serves as the investment manager of FVP Master Fund, (iii) FVP GP, LLC, a Delaware limited liability company (“FVP GP”), which serves as the general partner of FVP Master Fund, (iv) Firefly Management Company GP, LLC, a Delaware limited liability company (“Firefly Management”), which serves as the general partner of Firefly Partners, and (v) Messrs. Ryan Heslop and Ariel Warszawski, the managing members of FVP GP and Firefly Management (all of the foregoing, collectively, “Firefly”). Firefly reported that it has shared voting and dispositive power with respect to all of these shares as of December 31, 2018. This information is based solely on a Schedule 13G/A filed with the SEC by The Vanguard Group, Inc. (“Vanguard”) on February 11, 2019. Vanguard reported that it may be deemed to have sole voting power as to 35,727 shares, shared voting power as to 9,798 shares, sole dispositive power with respect to 3,146,832 shares and shared dispositive power with respect to 40,966 shares as of December 31, 2018. This information is based solely on a Schedule 13G/A filed with the SEC by Dimensional Fund Advisors LP (“Dimensional”) on February 8, 2019. Dimensional reported that it may be deemed to have sole voting power as to 2,759,974 shares, no shared voting power with respect to any shares, sole dispositive power with respect to 2,891,463 shares and no shared dispositive power with respect to any shares as of December 31, 2018. This information is based solely on a Schedule 13G/A filed with the SEC by BlackRock, Inc. (“BlackRock”) on February 6, 2019. BlackRock reported that it may be deemed to have sole voting power with respect to 2,360,981 shares and sole dispositive power with respect to 2,443,451 shares as of December 31, 2018. This information is based solely on a Schedule 13G filed with the SEC by UBS Group AG on behalf of itself and its wholly owned subsidiaries, UBS AG London Branch, UBS Securities LLC, and UBS Financial Services Inc. (collectively, “UBS”), on February 15, 2019. UBS reported that it has shared voting and dispositive power with respect to all of these shares as of December 31, 2018. This information is based solely on a Schedule 13G filed with the SEC on February 14, 2019 by (i) TIAA-CREF Investment Management, LLC, (ii) College Retirement Equities Fund-Stock Account and (iii) Teachers Advisors, LLC (all of the foregoing, collectively, “TIAA-CREF”). TIAA-CREF reported that it has sole voting and dispositive power with respect to all of these shares as of December 31, 2018. The following table sets forth information regarding the beneficial ownership of Common Stock by each current director and director nominee of the Company, by each current and former executive officer of the Company named in the Summary Compensation Table below, and by the current directors and executive officers of the Company as a group. Unless otherwise indicated, the information is provided as of the Record Date (i.e., March 6, 2019). Each of the persons listed below is the beneficial owner of less than 1% of the outstanding shares of Common Stock, and the current executive officers and directors as a group own approximately 2.0% of the outstanding shares of Common Stock. The table also reflects for each person the number of Common Stock units associated with compensation deferred under the Company’s Deferred Compensation Plan. None of the persons named below has pledged any of his/her shares as security. Unless otherwise noted, the specified persons have sole voting power and sole dispositive power as to the indicated shares. The Company has the sole right to vote all shares of Common Stock underlying the Common Stock units held in the Deferred Compensation Plan Trust. The independent trustee of the Trust has dispositive power as to such shares. Includes 41,802 shares that Mr. Antoniuk has the right to acquire pursuant to the Company’s 2013 Omnibus Incentive Plan within sixty days following the record date for the 2019 Annual Meeting. Includes 3,642 shares that Mr. Doerr has the right to acquire pursuant to the Company’s 2013 Omnibus Incentive Plan within sixty days following the record date for the 2019 Annual Meeting. Includes 213,617 shares that Mr. Pennypacker has the right to acquire pursuant to the Company’s 2013 Omnibus Incentive Plan within sixty days following the record date for the 2019 Annual Meeting. Includes 37,951 shares that Mr. Ravenscroft has the right to acquire pursuant to the Company’s 2013 Omnibus Incentive Plan within sixty days following the record date for the 2019 Annual Meeting. Includes 3,642 shares that Mr. Ruck has the right to acquire pursuant to the Company’s 2013 Omnibus Incentive Plan within sixty days following the record date for the 2019 Annual Meeting. Includes 305,079 shares that the Company’s named executive officers have the right to acquire pursuant to the Company’s 2013 Omnibus Incentive Plan within sixty days following the record date for the 2019 Annual Meeting. Section 16(a) of the Securities Exchange Act of 1934 requires the Company’s officers and directors and persons owning more than ten percent of the Company’s Common Stock to file reports of ownership and changes in ownership of equity and derivative securities of the Company with the Securities and Exchange Commission and the New York Stock Exchange. To the Company’s knowledge, based on information provided by the reporting persons, all applicable reporting requirements for fiscal year 2018 were complied with in a timely manner, except as follows: the Form 4s reporting the grant of equity awards on February 20, 2018 to each of Messrs. Antoniuk, Doerr, Musial, Pennypacker and Ravenscroft were each filed on February 26, 2018 due to a clerical error. The annual compensation package for non-employee directors is designed to attract and retain highly experienced and qualified individuals to serve on the Company’s Board of Directors. It is also intended to be competitive relative to general industrial companies of comparable size to the Company. The Compensation Committee typically reviews the market competitiveness of the non-employee director compensation program every two years with the assistance of an outside consulting firm. The 2018 compensation package for non-employee directors consisted of cash (annual retainers) and equity (restricted stock unit) awards. No meeting fees were paid to non-employee directors in 2018. Directors are also entitled to reimbursement of their reasonable out-of-pocket expenses in connection with their travel to and from attendance at Board and committee meetings and other Company events. An individual director’s actual annual compensation will vary based on committee memberships and committee chair responsibilities. A significant portion of the target annual compensation package is delivered in the form of equity, which is designed to promote a strong alignment of interests between the Company’s non-employee directors and its shareholders. In 2018, the equity award, consisting of restricted stock units, was set based on the guideline value of $110,000. The number of shares granted were based on the 20-day average stock price prior to February 14, 2018 (which was the date of the distribution of meeting materials to the Board in connection with the February 2018 Board meeting). The accounting expense was based on the closing stock price as of the date of grant. The restricted stock units awarded to the non-employee directors in 2018 vested immediately on grant. Equity awards made in 2018 to non-employee directors were granted under the Company’s 2013 Omnibus Incentive Plan. The Compensation Committee may, in its discretion, grant awards from time-to-time in such amounts as it determines and to such non-employee directors as it selects. The Compensation Committee has determined that the guideline value of the equity award to be granted to non-employee directors will be increased from $110,000 to $120,000 beginning in 2019. The following table sets forth the total compensation earned by non-employee directors during the fiscal year ended December 31, 2018. Includes annual cash retainers for the board chair, board members, committee chairs and committee members. Reflects the grant date fair value of restricted stock units awarded in 2018, as computed under the Financial Accounting Standards Board’s Accounting Standards Codification Topic 718 (“ASC Topic 718”). The grant date fair value of restricted stock units awarded in 2018 is calculated by multiplying the number of restricted stock units awarded by the actual closing price of the Company’s common stock on the grant date. The restricted stock units awarded in 2018 vested immediately upon grant. Ms. Cooney and Messrs. Condon and Myers each deferred their 2018 restricted stock unit grant pursuant to the Company’s Deferred Compensation Plan. At year end, Ms. Cooney and Messrs. Condon and Myers each had 7,018 restricted stock units outstanding, while Messrs. Bohn, Krueger, and Pfeifer each had 4,151 restricted stock units outstanding. Messrs. Armes, Alapont and Lynn had no restricted stock units outstanding at year end. No stock options were awarded to directors in 2018, and no director had any outstanding stock options at year end. From time-to-time, spouses or guests of directors may be invited to accompany directors at a Company function at the Company’s expense. During 2018, spouses and guests of directors were invited to attend events related to the February Board meeting. The “All Other Compensation” column reflects amounts reimbursed by the Company for travel, meals, and other related expenses for those spouses and guests attending events related to the February Board meeting. Messrs. Alapont and Lynn tendered their resignations as directors of the Company in February 2018. After the forfeiture of their unvested restricted stock units granted in 2016 and 2017 in connection with their resignations, the Board reinstated and accelerated their unvested restricted stock units granted in 2016 and 2017. No amounts relating to these unvested restricted stock units are included in this table as no additional expenses or charges were incurred by the Company in connection with the reinstatement and acceleration of such unvested restricted stock units. Mr. Armes was appointed to the Board effective July 31, 2018, and the Compensation Committee determined that, for his Board and committee service in 2018, he would receive one-half of the 2018 cash award (i.e., one-half of the annual retainer for service as a Board member, one-half of the annual retainer for service on the Compensation Committee, and one-half of the annual retainer for service on the Governance Committee) and one-half of the 2018 equity award of restricted stock units. The Company’s corporate governance guidelines contain stock ownership guidelines for non-employee directors. The guidelines, as revised in 2016 due to the value of stock holdings being reduced as a result of the Spin-Off (as defined below), provide that by the later of (a) the end of the fifth calendar year after the non-employee director is first appointed as a member of the Board, or (b) the end of the third calendar year after the effective date of the Spin-Off, each non-employee director should acquire and hold an amount of the Company’s common stock with a value equal to five times the non-employee director’s total annual cash retainer (excluding any additional retainer for committee chair positions), with compliance measured annually at the first Board meeting in a given year, based on each non-employee director’s stock ownership and the stock price as of the close of business on the last day of the preceding calendar year. For purposes of determining stock ownership under the guidelines, unvested restricted stock will be included but unexercised options will not be included. Non-employee directors are required to retain net shares upon vesting of equity awards until achieving the level of stock ownership established in the guidelines. If a non-employee director has not met the level of stock ownership established in the guidelines as of the applicable measurement date, then the non-employee director must acquire shares during the subsequent calendar year equal in value to at least 50% of the total annual retainer paid or payable to the non-employee director during such subsequent calendar year, determined after tax. As of December 31, 2018, the non-employee directors were in compliance or projected to be in compliance (as applicable) with the stock ownership guidelines. Under the Company’s Deferred Compensation Plan, each non-employee director may elect to defer all or any part of his or her annual retainer, as well as restricted stock unit awards, for future payment upon death, disability, termination of service as a director, a date specified by the participant, or the earlier of any such date to occur. A director may use the Deferred Compensation Plan as a means of achieving the stock ownership guidelines applicable to the director by electing to defer a portion of his or her compensation under the Company’s Deferred Compensation Plan and investing in the Company’s stock units (value equivalent to the Company’s stock price). The Company’s strong financial performance in 2018 resulted in above target achievement of its financial goals under its annual incentive plan. Revenue increased $265.5 million, or 17% year-over-year, to $1,846.8 million, and Adjusted EBITDA increased $41.5 million year-over-year to $116.2 million. Consistent with our emphasis on performance-based pay, a significant proportion of our named executive officers’ target annual pay opportunity is based on financial results (relative to specific goals) and stock price appreciation over time. Commensurate with the Company’s 2018 performance, short-term incentive awards for 2018 were paid out above target. • Adjusted EBITDA increased to $116.2 million from $74.7 million in 2017. • Adjusted Operating Cash Flow provided cash of $40.1 million in 2018. • Short-term incentive awards (under the 2018 short-term incentive plan) were earned at 172.5% of target, reflecting above target financial performance. • Salary increases for certain named executive officers for 2018. A reconciliation of Adjusted EBITDA (a non-GAAP financial measure) to Net income (loss) from continuing operations (the most directly comparable GAAP financial measure) is included in Item 7. “Management’s Discussion and Analysis of Financial Condition and Results of Operations” (on page 33) of the Company’s Annual Report on Form 10-K for the year ended December 31, 2018. In addition, a reconciliation of Adjusted Operating Cash Flow (a non-GAAP financial measure) to Net cash used for operating activities (the most directly comparable GAAP financial measure) is included in Item 7. “Management’s Discussion and Analysis of Financial Condition and Results of Operations” (on page 34) of the Company’s Annual Report on Form 10-K for the year ended December 31, 2018. “GAAP” means accounting principles generally accepted in the United States of America. Our executive compensation program reflects a strong pay-for-performance design and incorporates many governance best practices. Over the past several years (subject to certain unusual factors related to the March 2016 spin-off of the Company’s former foodservice business into an independent, public company (the “Spin-Off”)), the Company’s executive compensation program design and practices have evolved to better support our changing business and talent needs, as well as to reflect market practices and trends. In particular, as summarized below, we have linked the pay program to key metrics of our business strategy and shareholder value creation through our short-term and long-term incentive plans. The Company’s approach is to apply a comprehensive perspective in selecting performance measures and setting goals for both the short-term and long-term incentive plans. As a result of the foregoing considerations, the performance metrics used in our short-term incentive plan and the financial measures used in our long-term incentive plan in connection with our performance share grants have continued to adapt along with our business strategy from year-to-year to best reflect the direct accountabilities assigned to the management team for a particular year (short-term incentives) and for several years (long-term incentives). • Adjusted EBITDA (weighted 50%), which is a useful measure of the Company’s annual operating performance, measures gross profit, less engineering, selling and administrative expenses, plus depreciation and certain other nonrecurring items. • Free Cash Flow (weighted 50%), which is an important measure that drives operational cash generation, equals non-GAAP adjusted operating cash flow, less capital expenditures, excluding the cash impact of certain nonrecurring items. • Adjusted EBITDA Percent for the year ending December 31, 2020 (“Fiscal Year 2020 Adjusted EBITDA Percent”) (weighted 50%), which is equal to gross profit, less engineering, selling, and administrative expenses, plus depreciation and certain other nonrecurring items, divided by net sales. • Stock options (50% of the targeted value of the LTIP grant) which vest in equal installments over three years, commencing on the first anniversary of the grant date, and have value only as the stock price increases. We continually monitor our executive compensation program and consider modifications that will allow us to drive achievement of our business strategy, meet our talent needs, and maintain market competitive plans to maximize long-term shareholder value. In designing our 2019 STIP and LTIP, we utilized the same performance measures utilized in our 2018 STIP and LTIP, as we believe that these performance measures continue to capture our key financial drivers of success and that use of consistent performance measures, with the goal of improvement in such performance measures over time, ensures that our executive compensation program is aligned with the interests of our shareholders, including maximizing long-term returns to our shareholders. In 2018, our say-on-pay advisory vote received support from approximately 94% of the shares voted. We believe that this result demonstrates our shareholders’ strong endorsement of the executive compensation program design, decisions and policies. Our shareholder vote was one of many factors considered by the Compensation Committee in reviewing the Company’s executive compensation program. We continue to maintain an ongoing dialogue with our shareholders to help ensure our executive compensation program is aligned with the interests of our shareholders. The Compensation Committee of the Board of Directors is primarily responsible for administering the Company’s executive compensation program. As such, the Compensation Committee reviews and approves all elements of the executive compensation program that cover the named executive officers. This review includes an annual consideration of the Company’s business strategy and talent needs and alignment of compensation to performance and shareholder interests. During fiscal 2014, the Compensation Committee hired, and it continues to engage, Willis Towers Watson (“Compensation Consultants”) as an independent compensation consultant to assist the Compensation Committee with its duties, including its review of the executive compensation program. Additional information about the role and processes of the Compensation Committee is presented in the Corporate Governance — Compensation Committee section of this Proxy Statement. Our executive compensation program is intended to align the interests of our executives with the interests of our shareholders as well as to motivate our executives to maximize long-term total returns to our shareholders. For these reasons, the Compensation Committee designs the executive compensation program consistent with market typical/best practices to ensure alignment between executive pay and Company performance. An important element of the compensation program design is to provide incentive-based compensation that is directly tied to Company performance. The Compensation Committee annually reviews the key elements of the program considering the Company’s business strategy and talent needs. Our executive compensation program seeks to provide competitive total compensation opportunities to attract, motivate and retain highly-qualified executives critical to the achievement of the Company’s financial and strategic goals. Paying for performance. A significant portion of the target compensation awarded to our named executive officers is incentive-based and “at risk,” meaning it is only earned if specific financial goals are achieved or, in the case of stock options, if the stock price appreciates over the next several years following the grant date. Incentive awards based on achievement of specific goals are capped at 200% of the targeted award opportunity. Providing market competitive compensation. Pay levels are targeted to be, on average, at market median levels based on individual factors (such as experience, length of service, and individual performance), internal structure and internal and external equity, business needs, Company performance, comparable positions at general industrial companies of similar size, and other factors. Encouraging long-term service. The Company offers retirement and savings plans, including the Company’s 401(k) Retirement Plan and Deferred Compensation Plan, which are payable after retirement from the Company and provide employees with the opportunity to earn Company contributions or save pre-tax dollars for retirement. Promoting executive stock ownership. Long-term incentive awards to executive officers are solely equity-based, and executive officers are subject to stock ownership guidelines to ensure meaningful ongoing alignment with shareholders’ interests and market best practice. Actual total compensation can vary from target compensation based on the individual’s performance and the Company’s financial and stock price performance. In accordance with SEC rules, the Summary Compensation Table shows the grant date fair value of LTIP grants, which grant date fair value is often very different from the actual realized and realizable/current values (if any amount is even earned) of such awards. The Committee annually reviews officer pay, the past several years of actual and target compensation, outstanding long-term incentive awards (including the potential realizable value at various stock prices), accumulated deferred compensation balances, and potential change-in-control severance amounts. In connection with our executive compensation determinations, we review third-party market survey data among comparable companies and broader market trends/developments, as provided by Willis Towers Watson. In setting market-based pay levels, the Compensation Committee reviews and relies primarily upon market data from surveys of comparably-sized general industrial companies. Survey data of comparable positions is analyzed annually in considering adjustments to base salaries and target short-term and long-term incentive award opportunities. Survey data is also reviewed periodically to help maintain the competitiveness of all elements of compensation. Consistent with the Company’s pay philosophy, the majority of the target total direct compensation (i.e., the sum of base salary and target STIP and LTIP award grant date values) of the named executive officers is only earned if specific financial goals are achieved or, in the case of stock options, if the stock price appreciates over the next several years following the grant date. Specifically, in 2018, performance-based incentive award opportunities represented, on average, 69% of the target total direct compensation for the named executive officers and reflected the use of stock options and performance shares. Award opportunities have typically been provided through a combination of short-term and long-term incentive opportunities, covering multiple financial and stock price performance measures. Incentive performance goals are set to directly align to our business strategy and long-term shareholder value creation. Long-term incentive awards are intended to align the interests of executives with those of Company shareholders by allowing executives to share in the growth and financial success of the Company, as reflected in the Company’s stock price and other performance measures. In addition, long-term incentive awards have facilitated the attraction, retention and motivation of executives and key employees. In 2018, long-term incentive award opportunities for named executive officers were provided through equity-based awards and are “at-risk,” requiring the achievement of specific multi-year performance goals or stock price appreciation. We believe the executive compensation program described in more detail below, by element and in total, best achieves our objectives. The following table presents a summary of each element of our executive compensation program. In setting total compensation, a consistent approach is applied for all executive officers. Executive officers may receive base salary and incentive pay increases at the time of promotions. In connection with promotions, the Compensation Committee may increase base salary and target incentive award percentages and make additional incentive grants. Additional detail regarding each pay element is presented below. Other than the Change in Control Severance Arrangements described below, the Company does not have employment agreements with any of the named executive officers. Cover different time periods, with short-term incentive plans covering one year and long-term incentive plans typically covering three years, with an ongoing stock ownership requirement. In order to best drive success, we believe a combination of performance measures should be used to ensure that management is motivated and rewarded for managing the Company’s overall financial health and driving long-term sustainable growth in value for the Company’s shareholders. As such, the short-term incentive plan and performance share component of the long-term incentive plan each use two performance metrics, which may change from year-to-year to reflect the critical areas of focus for the applicable performance period. The Compensation Committee believes that, collectively, the performance metrics used will best drive long-term shareholder value and align management rewards to the Company’s business strategy. Short-Term Incentives. Short-term incentive awards are made under the 2013 Omnibus Incentive Plan and are referred to in this Proxy Statement as STIP awards. STIP awards, which are measured on an annual basis, reward eligible participants for maximizing shareholder value. The 2018 STIP award was based 50% on free cash flow performance and 50% on Adjusted EBITDA. The free cash flow (50%) and Adjusted EBITDA (50%) metrics were selected to focus the executive team on increasing shareholder value over time and maintaining adequate liquidity for working capital requirements and future investment opportunities. For all of the named executive officers, the 2018 STIP awards were based on overall Company performance (rather than a combination of business unit performance and Company performance). 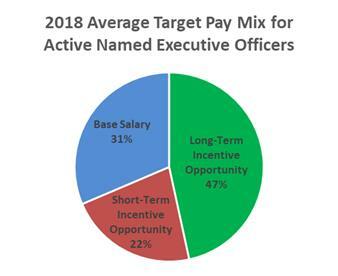 The 2018 target short-term incentive award percentages assigned to the Company’s named executive officers ranged from 55% to 100% of base salary, based on the position’s responsibilities and business impact. Awards earned under the 2018 STIP can range from 0% to 200% of an individual’s target award opportunity based on actual results versus the target performance goals for the year, and the Compensation Committee may exercise discretion to reduce the incentive award otherwise earned by a participant in any year based on individual or other performance factors determined by the Committee. Earned awards, if any, are fully paid out after the end of the year. “Adjusted EBITDA” equals gross profit, less engineering, selling and administrative expenses, plus depreciation and certain other nonrecurring items. “Free Cash Flow” equals non-GAAP adjusted operating cash flow, less capital expenditures, excluding the cash impact of certain nonrecurring items. Straight-line interpolation is used for calculating the payout between the specific performance levels. A reconciliation of Adjusted EBITDA (a non-GAAP financial measure) to Net income (loss) from continuing operations (the most directly comparable GAAP financial measure) is included in Item 7. “Management’s Discussion and Analysis of Financial Condition and Results of Operations” (on page 33) of the Company’s Annual Report on Form 10-K for the year ended December 31, 2018. (5) A reconciliation of Free Cash Flow (a non-GAAP financial measure) to non-GAAP adjusted operating cash flow is included in Annex B to this Proxy Statement. In addition, a reconciliation of non-GAAP adjusted operating cash flow to Net cash used for operating activities (the most directly comparable GAAP financial measure) is included in Item 7. “Management’s Discussion and Analysis of Financial Condition and Results of Operations” (on page 34) of the Company’s Annual Report on Form 10-K for the year ended December 31, 2018. The actual 2018 STIP award payouts for the named executive officers are presented in the Summary Compensation Table in the “Non-Equity Incentive Plan Compensation” column. The potential dollar range of the 2018 STIP awards for each named executive officer is presented in the Grants of Plan-Based Awards table. Use of Discretion. The Compensation Committee did not use discretion to pay awards under the 2018 STIP that would not have otherwise been earned. The Compensation Committee is permitted to apply discretion in considering potential adjustments presented by management in order to assess performance of continuing operations. In practice, the Compensation Committee has made a limited number of adjustments, which, for awards to be earned by executives during a particular year, must be determined no later than the Compensation Committee’s February meeting. The Compensation Committee reviews the actual results for a year and considers and approves potential adjustments. With respect to the executive officers of the Company, these adjustments for a plan year must be made no later than the February Compensation Committee meeting of that year. Long-Term Incentives. Long-term incentive award grants are made under the 2013 Omnibus Incentive Plan. Long-term incentive awards are intended to align the interests of executives with those of shareholders by allowing executives to share in the growth and financial success of the Company, as reflected in the Company’s stock price and other performance measures. In addition, long-term incentive awards facilitate the attraction, retention and motivation of executives and key employees. Expire 10 years after the grant date. Performance Shares. Performance share award opportunities were provided to the named executive officers in 2018 to directly align the shares earned, if any, to the achievement of specific multi-year goals. The goals and the performance period were established by the Compensation Committee at the time of the award grant. 2018 Performance Share Grant. The 2018 performance share grant, which is based on a three-year performance period ending on December 31, 2020 and will vest on the third anniversary of the grant date if performance goals are met, was based on two equally weighted metrics – Fiscal Year 2020 Adjusted EBITDA Percent and relative TSR as compared to companies in the S&P SmallCap 600 Industrials Index. For these purposes, Fiscal Year 2020 Adjusted EBITDA Percent is equal to gross profit, less selling, general and administrative expenses, plus depreciation and restructuring charges, divided by net sales, and TSR, which is calculated using the 20-trading day average closing stock price at the beginning and end of the three-year performance period, is defined as stock price appreciation plus dividends reinvested on the ex-dividend date over the three-year performance period. If TSR is negative, the TSR portion of the performance share payout cannot exceed the target. 2017 Performance Share Grant. The 2017 performance share grant was based on two equally-weighted metrics – Adjusted EBITDA Percent and relative TSR as compared to companies in the S&P SmallCap 600 Industrials Index – over the three-year performance period from January 1, 2017 through December 31, 2019. For these purposes, Adjusted EBITDA Percent is equal to gross profit, less engineering, selling and administrative expenses, plus depreciation and certain other nonrecurring charges, divided by net sales, and TSR, which is calculated using the 20-trading day average closing stock price at the beginning and end of the three-year performance period, is defined as stock price appreciation plus dividends reinvested on the ex-dividend date over the three-year performance period. 2016 Performance Share Grant. The 2016 performance share grant was based on two equally-weighted metrics – Return on Invested Capital (“ROIC”) and relative TSR as compared to companies in the S&P SmallCap 600 Industrials Index – over the three-year performance period from January 1, 2016 through December 31, 2018. For these purposes, ROIC is equal to the three-year weighted average ROIC, defined as Net Operating Profit After Tax, excluding the impact of the Spin-Off and other one-time related costs, divided by average invested capital derived as equity plus interest bearing debt, less cash and marketable securities, and relative TSR is as defined above. For purposes of measuring relative TSR, the Company’s peer group included the companies included in the S&P SmallCap 600 Industrials Index as of January 1, 2016 that were still actively traded at the end of the performance period (on December 31, 2018). Based on actual performance over the three-year performance period, awards were earned at approximately 40.5% of target (as reflected in the table below) and will be paid in 2019 following certification of results by the Compensation Committee. Restricted Stock Units. In April 2018, the Company made an equity-based award of restricted stock units to Mr. Ruck in connection with his employment with the Company. These restricted stock units vest 50% on the second anniversary of his employment commencement date and 50% on the third anniversary of his employment commencement date. Grant Guideline Development. Consistent with past practice, the Compensation Committee annually sets award guidelines for each executive officer and job classification level based upon survey market median levels and the Company’s recent average stock price. LTIP awards to named executive officers were made in the first quarter of 2018. The approximate 20-trading-day average closing price ending on February 14, 2018 (which was the date of the distribution of meeting materials to the Board in connection with the February 2018 Board meeting) was used for determining the target performance award grant levels in 2018. The Black Scholes value was used to determine the number of options granted, however, the actual option grant price and accounting expense were determined at the date of grant. The grant date fair value of the 2018 equity grants are presented in the Grants of Plan-Based Awards table. The ultimate value that will be realized, if any, is not determinable at the date of grant. 401(k) Retirement Plan. Active, regular, full-time, non-union, U.S. based employees (including the named executive officers) are eligible to participate in The Manitowoc Company, Inc. 401(k) Retirement Plan, which allows employees to build retirement savings on a tax-deferred basis. The plan has a tax-qualified defined contribution savings component, the 401(k) Savings feature, in which participating employees receive a Company match. In addition, the plan has a Retirement Plan feature, in which the Company provides an annual contribution of from 0% to 4% of eligible compensation to another defined contribution account. There are no employee contributions to the Retirement Plan feature. Contributions under the Retirement Plan feature are based on STIP award achievement, subject to a cap, and are reviewed and approved by the Company’s Retirement Committee. The value of Company annual matching contributions to the 401(k) Retirement Plan under the Savings feature is presented in the Summary Compensation Table and the All Other Compensation Table. Deferred Compensation. To further assist in attracting and retaining highly-qualified employees, to facilitate stock ownership and to encourage saving for retirement, executive officers and other key employees are eligible to participate in the Deferred Compensation Plan, which may include a Company contribution. Detailed information about the Deferred Compensation Plan is presented in the Non-Qualified Deferred Compensation table and in the narrative following that table. In addition, the value of the Company’s annual contributions to the Deferred Compensation Plan on behalf of the named executive officers is presented in the Summary Compensation Table in the “All Other Compensation” column and in the All Other Compensation Table. Perquisites and Personal Benefits. In order to provide a market competitive total compensation package, the Company provides a limited amount of perquisites and supplemental benefits to our named executive officers. In 2018, the Company provided the following: supplemental long-term disability insurance, COBRA reimbursement, tax preparation, car allowance, memberships, expatriate benefits (including rent, housing-related insurance, educational expenses and car allowance), limited personal use of aircraft, commercial air flights for family members, meals and other expenses for spouses of the named executive officers in connection with the February 2018 Board meeting and gross-up payments on taxable fringe benefits. The value of perquisites and supplemental benefits, in total and itemized, provided in 2018 are presented in the Summary Compensation Table and the All Other Compensation Table. Change in Control Severance Arrangements. In order to facilitate attraction and retention of highly-qualified executives, the Company has arrangements (“Contingent Employment Agreements”) with the named executive officers and certain other key executives, which provide for the executives’ continued employment (for a three-year period for Mr. Pennypacker and for a two-year period for the other executives) upon a change in control. In addition, the arrangements provide for certain severance benefits in the event the executive is terminated without “cause” (as defined in the Contingent Employment Agreements) prior to the end of the employment period (as such, the Contingent Employment Agreements have a “double trigger”). The severance benefits would consist of base salary, annual incentive bonus compensation (calculated at the target level), and other benefits that the executive otherwise would have been entitled to if his employment had not been terminated prior to the respective three or two year change in control employment period. Further detail regarding these agreements is presented in the Post-Employment Compensation section of this Proxy Statement. Severance Pay Plan. The Company also has a severance pay plan that establishes a discretionary severance program across the Company whereby all severance benefits are provided at the Company’s sole discretion and will be designed to meet the specific facts and circumstances of each termination. The Board of Directors and the Compensation Committee have the sole authority to authorize any benefits under the plan to any officer of the Company. Other than this discretionary severance pay plan, the Company does not generally have a formal severance plan for other forms of employment termination, except for the Contingent Employment Agreements as described below. Stock ownership includes shares owned outright, restricted stock, restricted stock units, and stock equivalents held in deferred compensation and/or retirement plans. Additionally, one-half of the guideline amount can be met by vested, in-the-money stock options held by the executive officer. As of December 31, 2018, none of the named executive officers were required to meet such guidelines due to their tenure with the Company, but all of the named executive officers were projected to be in compliance with such guidelines. If an executive officer does not meet the relevant ownership guideline on the applicable measurement date, the executive officer must retain all net shares from the exercise of stock options and the vesting of restricted shares, restricted stock units and performance shares until compliance is achieved. Stock Awards Granting Policy. In 2018, based on the approval of the Compensation Committee, the Company granted stock awards to its executive officers and other eligible key employees. In 2018, stock awards to executive officers consisted of stock options and performance shares and, with respect to Mr. Ruck, restricted stock units. Annual stock awards are generally granted in February. Stock awards are also used to attract executives and key employees, and, as such, stock awards are at times granted to executives and key employees at the time they become executives or key employees of the Company. In such cases, the grant date would be the date employment commences or the date the Compensation Committee approves the awards. In all cases, the exercise price of stock options is the closing trading price on the grant date. As previously noted, in April 2018, the Company made a special equity-based award of restricted stock units to Mr. Ruck in connection with his employment with the Company. Securities Trading Policy. The Company maintains an Insider Trading Policy that imposes specific standards on directors, officers and key employees of the Company. The policy is intended not only to forbid such persons from trading in Company stock on the basis of inside information, but to avoid even the appearance of improper conduct on the part of such persons. The policy also prohibits employees from pledging their holdings of Company securities and from engaging in hedging transactions involving Company securities. In addition to the specific restrictions set forth in the policy, the policy requires that all transactions in Company stock by such persons and by others in their households be pre-cleared by the Corporate Secretary’s office. The only exception to the pre-clearance requirement is regular, ongoing acquisitions of Company stock resulting from continued participation in employee benefit plans that the Company or its agents administer. Pay Clawbacks. Our Chief Executive Officer and Chief Financial Officer are subject to any clawbacks that may be required under Section 304 of the Sarbanes-Oxley Act of 2002. Tax Deductibility of Executive Compensation. Section 162(m) of the Internal Revenue Code of 1986, as amended (“Section 162(m)”), generally limits the Company’s federal income tax deduction to $1 million per person per year for compensation paid to certain executive officers, including each of our named executive officers. Prior to 2018, compensation that qualified as performance-based compensation under Section 162(m) was fully deductible provided certain requirements of Section 162(m) were satisfied. However, as a result of changes made by the Tax Cuts and Jobs Act, for our 2018 fiscal year, only performance-based compensation that was paid pursuant to a binding contract in effect on November 2, 2017 could be exempt from the $1 million deduction limit. During 2018, we took appropriate actions to preserve the deductibility of performance-based compensation granted prior to November 2, 2017. However, because we believe that many different factors influence a well-rounded, comprehensive executive compensation program, as discussed above under “Compensation Program Objectives and Philosophy,” the Compensation Committee did not limit, and does not intend to limit in future years, the compensation of our executive officers to a level that is fully deductible under Section 162(m). Use of an Independent Compensation Consultant. The Compensation Committee engaged Willis Towers Watson, an executive consulting firm, as its independent compensation consultant to provide advice on compensation trends and market information to assist the Compensation Committee in fulfilling its duties, including the following responsibilities: review executive compensation and advise of changes to be considered to improve effectiveness consistent with our compensation philosophy; provide market data and recommendations on Chief Executive Officer and executive compensation; review materials for Compensation Committee meetings and attend Compensation Committee meetings; and advise the Compensation Committee on best practices for governance of executive compensation as well as areas of possible concern or risk in the Company’s programs. Willis Towers Watson was directly engaged by and is accountable to the Compensation Committee, and has not been engaged by management for other services, except as discussed below. During fiscal 2018, Willis Towers Watson was paid $199,829 for executive compensation advice, director compensation advice and other services to the Compensation Committee. During fiscal 2018, Willis Towers Watson was also paid $58,151 for other human resource and accounting services to the Company, and Willis Towers Watson was retained by management for these services. The Compensation Committee’s oversight of the relationship between the Company and Willis Towers Watson mitigates the possibility that management could misuse other engagements to influence Willis Towers Watson’s compensation work for the Compensation Committee. Willis Towers Watson has adopted internal safeguards to ensure that its executive compensation advice is independent. The Compensation Committee retains ultimate decision-making authority for all executive pay matters and understands Willis Towers Watson’s role is simply that of advisor. The absence of any significant business or personal relationship between Willis Towers Watson and any of our executives or members of the Compensation Committee. The foregoing factors are still relevant to the Compensation Committee’s ongoing and annual assessment to continue utilizing the compensation consultant services of Willis Towers Watson. For fiscal 2018, Willis Towers Watson also provided the Compensation Committee with a written assessment of the independence of Willis Towers Watson’s advisory work to the Committee. Based on the foregoing, the Compensation Committee has concluded that the engagement of Willis Towers Watson does not raise any conflict of interest. Pay Mix. The Company’s executive compensation program primarily consists of base salary, short-term incentive compensation, and long-term incentive compensation. Base salaries are targeted at median, which mitigates the need for our executive officers to take significant risks to earn average compensation. However, we also place a sufficient portion of each executive officer’s pay at risk to ensure that the interests of our executives are well-aligned with those of our shareholders, driving long-term shareholder value. Time Horizon. Our 2016, 2017 and 2018 LTIP awards are based on a three-year performance period, which encourages our employees to focus on sustained performance of the Company over the long-term, rather than taking short-term risks. Performance Goals. Our STIP and LTIP goals are set at levels that are attainable without taking inappropriate risks, but that still require stretch performance. We also cap our STIP and LTIP payouts to 200% of the target payout amount for each of our executives, which further helps control excessive risk taking at the expense of longer term financial success. Stock Ownership Guidelines and Hedging Policies. We have stock ownership guidelines in place for each of our named executive officers, which further aligns the interests of our executive officers with those of our shareholders. We also prohibit employees from pledging their holdings of Company securities and from engaging in hedging transactions involving Company securities. The Compensation Committee has reviewed and discussed this Compensation Discussion and Analysis for fiscal year 2018 with the Company’s management. Based on this review and discussion, the Compensation Committee recommended to the Board, and the Board has approved, that the Compensation Discussion and Analysis be incorporated by reference in the Company’s Annual Report on Form 10-K for the fiscal year ended December 31, 2018 and included in the Company’s Proxy Statement for filing with the SEC. The following table sets forth the “total compensation” earned by each named executive officer during the fiscal year ended December 31, 2018, and, to the extent that a named executive officer was a named executive officer of the Company for the fiscal years ended December 31, 2017 or December 31, 2016, total compensation for service to the Company during those years. In accordance with SEC rules and guidance, information for fiscal years prior to the year in which an individual first became a named executive officer is not required to be presented. Actual payouts are presented in the “Salary” (before deferrals) and “Non-Equity Incentive Plan Compensation” (2018 STIP award payouts) columns. The grant date fair value of equity-based grants awarded in 2018 is shown in the “Stock Awards” and “Options Awards” columns. None of this amount was realized during 2018; instead, the actual value realized, if any, will be commensurate with our financial and stock price performance over the next several years. The amounts listed in the “Stock Awards” column represent the aggregate grant date fair value of all restricted stock unit, restricted stock, and performance share awards in accordance with ASC Topic 718. Mr. Ruck was the only named executive officer who received restricted stock units in 2018. The value attributable to the 2018 grant of restricted stock units to Mr. Ruck was $754,290. For this restricted stock unit award, fair value is computed by multiplying the total number of shares subject to the award by the closing market price on the date of grant. For performance share awards, fair value is calculated based upon the probable outcome of the performance conditions, consistent with the estimate of the aggregate compensation cost to be recognized over the service period determined as of the grant date under ASC Topic 718, and was as follows for 2018 awards: Mr. Pennypacker — $1,115,797; Mr. Antoniuk — $353,049; Mr. Ravenscroft — $290,098; Mr. Doerr — $178,511; and Mr. Ruck — $222,012. Performance shares are earned based on our financial performance over a three-year period, and vest on the third anniversary of the grant date if performance goals are met. The maximum values of the 2018 grants of performance shares at the grant date, assuming that the highest level of performance conditions are attained, are as follows: Mr. Pennypacker — $2,231,593; Mr. Antoniuk — $706,098; Mr. Ravenscroft — $580,195; Mr. Doerr — $357,022; and Mr. Ruck — $444,025. 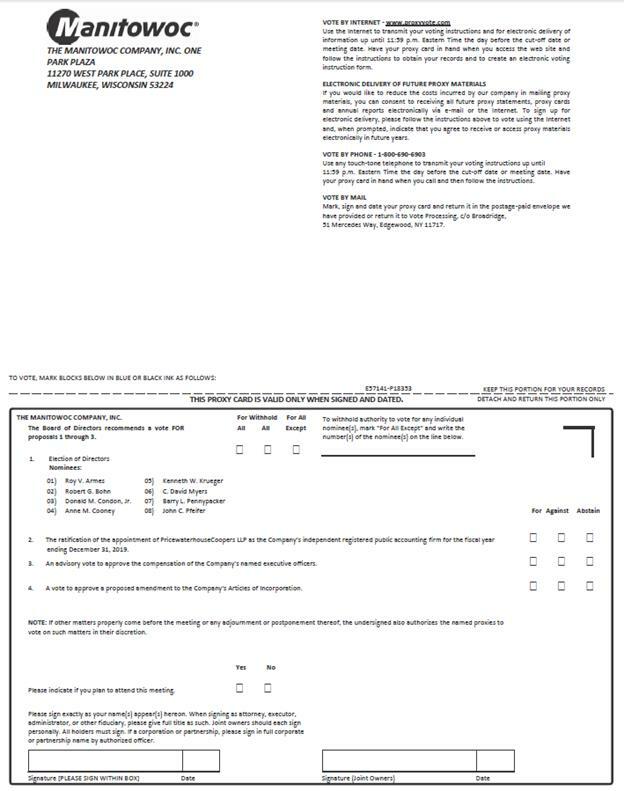 Additional information about the assumptions that we used in valuing equity awards is set forth in Note 16 to the Consolidated Financial Statements for the fiscal year ended December 31, 2018 in our Annual Report on Form 10-K filed with the SEC on February 13, 2019. Pursuant to SEC rules, the amounts shown exclude the impact of estimated forfeitures related to service-based vesting conditions. The grant date fair value of the 2017 stock awards (which include only performance share awards), as presented in the “Stock Awards” column, is different than the value of such stock awards as of December 31, 2018. Based on the closing price ($14.77) of the Company’s common stock on December 31, 2018, without regard to vesting schedules and assuming target performance with respect to the performance shares, the values of the 2017 stock awards were as follows as of December 31, 2018: Mr. Pennypacker — $696,598; Mr. Antoniuk — $220,413; and Mr. Ravenscroft — $125,397. The values in the “Stock Awards” column with respect to 2016 include the grant date fair value of performance shares for Mr. Pennypacker and the grant date fair values of both restricted stock units and performance shares for Mr. Antoniuk and Mr. Ravenscroft. The grant date fair values of the 2016 performance share awards were as follows: Mr. Pennypacker – $1,654,072; Mr. Antoniuk — $226,889; and Mr. Ravenscroft — $264,653. These values are different than the values of such performance share awards as of December 31, 2018. Based on the closing price ($14.77) of the Company’s common stock on December 31, 2018, without regard to vesting schedules and based on the actual performance of 40.5% of target with respect to the performance shares, the values of the 2016 performance share awards were as follows as of December 31, 2018: Mr. Pennypacker — $434,725; Mr. Antoniuk — $59,626; and Mr. Ravenscroft — $69,552. The amounts listed in the “Option Awards” column represent the aggregate grant date fair value of all option awards granted during the year in accordance with ASC Topic 718. Additional information about the assumptions that we used in valuing equity awards is set forth in Note 16 to the Consolidated Financial Statements for the fiscal year ended December 31, 2018 in our Annual Report on Form 10-K filed with the SEC on February 13, 2019. The grant date fair value of the 2016 and 2017 option awards, as presented in the “Option Awards” column, is different than the value of such option awards as of December 31, 2018. Based on the closing price ($14.77) of the Company’s common stock on December 31, 2018 and the exercise prices of the 2016 and 2017 option awards (which were all higher than $14.77) and without regard to vesting schedules, the values of the 2016 and 2017 option awards were as follows as of December 31, 2018: Mr. Pennypacker — $0; Mr. Antoniuk — $0; and Mr. Ravenscroft — $0. Consists of cash awards made under the 2018 STIP. Reflects the amount earned for performance during 2018 but not paid until 2019. Consists of the compensation described in the All Other Compensation Table, which follows this table. The following table sets forth the specific items included in the “All Other Compensation” column of the Summary Compensation Table. Consists of contributions made by the Company during the year indicated under The Manitowoc Company, Inc. 401(k) Retirement Plan. As explained in the Compensation Discussion and Analysis, this Plan includes both a tax-qualified defined contribution savings component in which the participant receives a Company match, and a retirement plan feature in which the Company provides an annual contribution of between 0% to 4% of eligible compensation to another defined contribution account. Includes premiums paid for Supplemental Executive Long Term Disability Insurance for all executives and COBRA reimbursement for Mr. Ruck. For 2018, includes the Company’s contributions for 2018, which will be contributed to individual accounts in 2019. For 2017, includes the Company’s contributions for 2017, which (a) were contributed to individual accounts as follows in 2018 – Mr. Pennypacker – $8,100; Mr. Antoniuk – $8,100; and Mr. Ravenscroft – $8,100, and (b) will be contributed to individual accounts as follows in 2019 – Mr. Pennypacker – $40,551; Mr. Antoniuk – $16,400; and Mr. Ravenscroft – $7,385. For 2018, includes (a) expenses related to personal use of the Company aircraft – Mr. Pennypacker –$3,028 and Mr. Antoniuk – $655; (b) expenses for commercial air flights for officers’ families – Mr. Pennypacker – $1,261, Mr. Antoniuk – $715, Mr. Ravenscroft – $15,508, and Mr. Doerr – $498; (c) in connection with Mr. Ravenscroft’s assignment to France, expatriate benefits (including amounts paid by the Company for rent, housing-related insurance, educational expenses, and car allowance) which were paid in Euros but converted to U.S. dollars at the exchange rates in effect when the payments were made – $207,482; (d) tax preparation fees in connection with Mr. Ravenscroft’s assignment to France – $6,490; (e) personal use of memberships: Mr. Ravenscroft – $181; (f) gross-up payments on taxable fringe benefits – Mr. Pennypacker – $180, Mr. Antoniuk – $46, Mr. Ravenscroft – $767, and Mr. Doerr – $17; and (g) meals and other expenses paid by the Company for the spouses of the named executive officers in connection with the February 2018 Board meeting – Mr. Pennypacker –$593, Mr. Antoniuk – $817, and Mr. Doerr – $593. For 2017, includes (a) expenses related to personal use of the Company aircraft – Mr. Pennypacker – $7,604 and Mr. Antoniuk – $4,775; (b) in connection with Mr. Ravenscroft’s assignment to France during November and December 2017, expatriate benefits (including amounts paid by the Company for rent, housing-related insurance, educational expenses, and car allowance) and moving expenses, which were paid in Euros, but were converted to U.S. dollars for purposes of this table at the fiscal year-end exchange rate of 1 Euro = 1.20030 U.S. dollars – $183,125; and (c) gross-up payments on taxable fringe benefits – Mr. Pennypacker – $179, Mr. Antoniuk – $116, and Mr. Ravenscroft – $9. For 2016, includes (a) expenses related to personal use of the Company aircraft – Mr. Pennypacker – $2,619 and Mr. Antoniuk – $293; (b) personal use of memberships: Mr. Pennypacker – $1,970; (c) Mr. Ravenscroft’s signing bonus – $50,000; and (d) gross-up payments on taxable fringe benefits – Mr. Pennypacker – $110 and Mr. Antoniuk – $7. The following table sets forth the 2018 STIP awards and equity awards granted under the Company’s 2013 Omnibus Incentive Plan. Any STIP awards earned in 2018 were paid in the first quarter of 2019. Other than the equity awards disclosed below, there were no other equity-based incentive awards granted to the named executive officers in 2018. These amounts represent potential payments under the 2018 STIP; the actual amounts received (if any) are shown in the Summary Compensation Table above. The threshold amount reflects the total of the threshold payment levels that represent 50% of the target amount. The maximum amount reflects the total amount of maximum payment levels that represent 200% of the target amount. These amounts represent potential payouts under the 2018 LTIP. The threshold amount reflects the total of the threshold payout levels that represent 25% of the target amount. The maximum amount reflects the total amount of maximum payout levels that represent 200% of the target amount. The stock options vest over a three-year period, commencing on the first anniversary of the grant date. The exercise price equals the closing market price of our common stock on the date of grant. Reflects the grant date fair value of the awards granted in 2018 as computed under ASC Topic 718. The following table sets forth the stock options, restricted stock units, restricted stock awards, and performance share awards previously granted to the named executive officers relating to our common stock that were outstanding at the end of 2018. The number of shares of common stock underlying option awards and stock awards has been adjusted, with respect to awards granted prior to November 17, 2017, to account for the 1-for-4 reverse stock split that was effected on November 17, 2017. Consists of options to purchase common stock of the Company under the Company’s 2013 Omnibus Incentive Plan and 2003 Incentive Stock and Awards Plan. Consists of restricted stock awards, restricted stock units and performance shares granted under the 2013 Omnibus Incentive Plan. Unless otherwise noted in these footnotes, all unvested stock options referenced in this table vest 33% per year beginning on the first anniversary of the grant date and continuing on each subsequent anniversary until the third anniversary of the grant date. The exercise price equals the closing market price of our common stock on the date of grant, as adjusted, for awards granted prior to November 17, 2017, to account for the 1-for-4 reverse stock split. The market value is calculated by multiplying the closing price of our common stock on December 31, 2018 ($14.77) by the number of unvested shares. Vests 25% per year beginning on the first anniversary of the grant date and continuing on each subsequent anniversary until the fourth anniversary of the grant date. Includes performance share awards granted in 2016 under the 2013 Omnibus Incentive Plan. The performance period expired at the end of 2018. Actual performance for the 2016 grant was at 40.5% of target and will be paid in 2019 after certification by the Compensation Committee. Includes performance share awards granted in 2017 under the 2013 Omnibus Incentive Plan. The performance period expires at the end of 2019. As of December 31, 2018, the performance trend was above threshold level, so the number of shares appearing here is the number of shares that would be awarded assuming target performance is achieved, pursuant to SEC requirements. Includes performance share awards granted in 2018 under the 2013 Omnibus Incentive Plan. The performance period expires at the end of 2020. As of December 31, 2018, the performance trend was above threshold level, so the number of shares appearing here is the number of shares that would be awarded assuming target performance is achieved, pursuant to SEC requirements. Includes restricted stock units granted in 2016 under the 2013 Omnibus Incentive Plan. These restricted stock units vest on the third anniversary of the grant date. Includes restricted stock units granted in 2017 under the 2013 Omnibus Incentive Plan. These restricted stock units vest on the third anniversary of the grant date. Includes restricted stock units granted in 2018 under the 2013 Omnibus Incentive Plan. These restricted stock units vest 50% on the second anniversary of the grant date and 50% on the third anniversary of the grant date. During 2018, no named executive officer exercised any stock options or had any stock awards that vested. The following table sets forth information with respect to the Company’s Deferred Compensation Plan, a non-qualified plan, as of December 31, 2018. Reflects elective deferrals of compensation earned or payable in 2018. These amounts are also included in the “Salary” and “Non-Equity Incentive Plan Compensation” columns in the Summary Compensation Table (as applicable). The Company’s contributions for 2018 will be contributed to individual accounts in 2019. These amounts are also included in the “All Other Compensation” column of the Summary Compensation Table and the “Company Contributions Under Deferred Compensation Plan” column of the All Other Compensation Table. Does not include the following amounts, which represent the Company’s contributions for 2017 and were contributed or will be contributed to individual accounts in 2018 and 2019: Mr. Pennypacker – $48,651 ($8,100 contributed in 2018 and $40,551 to be contributed in 2019); Mr. Antoniuk – $24,500 ($8,100 contributed in 2018 and $16,400 to be contributed in 2019); and Mr. Ravenscroft – $15,485 ($8,100 contributed in 2018 and $7,385 to be contributed in 2019). These amounts are also included, with respect to 2017, in the “All Other Compensation” column of the Summary Compensation Table and the “Company Contributions Under Deferred Compensation Plan” column of the All Other Compensation Table. If these amounts were included in the “Aggregate Balance at Last FYE” column, the aggregate balances would be as follows: Mr. Pennypacker – $193,024; Mr. Antoniuk – $185,655; Mr. Ravenscroft – $108,546; Mr. Doerr – $0; and Mr. Ruck – $0. Of the amounts reported in the “Aggregate Balance at Last FYE” column, the following amounts were previously reported in the Non-Qualified Deferred Compensation table in the Company’s proxy statement for its 2018 annual meeting of shareholders: Mr. Pennypacker - $151,249; Mr. Antoniuk - $43,890; and Mr. Ravenscroft - $30,632. Messrs. Doerr and Ruck were not named executive officers in 2017 and therefore were not included in the Non-Qualified Deferred Compensation table in the Company’s proxy statement for its 2018 annual meeting of shareholders. Eligible participants in the Deferred Compensation Plan may elect to defer up to 40% of base salary and up to 100% of awards to be paid under the STIP. Credits to deferred compensation accounts may also include a Company contribution. This contribution equals the amount of compensation deferred by the participant for the plan year (subject to a maximum of 25% of eligible compensation) multiplied by a rate equal to the rate of variable retirement plan contributions that the participant received from the Company during the year under the 401(k) Retirement Plan, plus 1%. If the Company does not make a contribution to the 401(k) Retirement Plan during the year, there will not be any Company contribution under the Deferred Compensation Plan for that year. Deferred amounts can be invested into a variety of accounts, which mirror the performance of several different mutual funds offered in the 401(k) Retirement Plan, as well as the Company Stock Fund (which includes only the Company’s common stock). Transfers between the Company Stock Fund and the other funds are not permitted. Participants are not required to direct any minimum amount of deferred compensation into the Company Stock Fund. In 2015, the Company adopted a new form of Contingent Employment Agreement (the “Contingent Employment Agreement”) for its executive officers (and certain other key executives and employees of the Company and certain subsidiaries) to replace the previous similar agreement with such individuals. All of the Company’s executive officers have executed the new Contingent Employment Agreement. The Contingent Employment Agreements provide generally that in the event of a “change in control” (as defined in the Agreements) of the Company, each executive officer will continue to be employed by the Company for a period of time (three years in the case of the Chief Executive Officer and two years in the case of the other named executive officers). Under the Contingent Employment Agreements, each executive will remain employed at the same position held as of the change in control date, and will receive a salary at least equal to the salary in effect as of such date, plus all bonuses, incentive compensation, and other benefits extended by the Company to its executive officers and key employees, provided that the plans and bonus opportunity are no less favorable than those that were available prior to a change in control. After a change in control, the executive officer’s compensation would be subject to potential upward adjustment at least annually based upon the executive officer’s contributions and the level of increases provided to other executive officers and employees. Each Contingent Employment Agreement terminates prior to the end of the applicable employment period if the executive officer voluntarily retires from the Company or is terminated by the Company “for cause,” as defined in the Contingent Employment Agreement. In the event the executive officer is terminated by the Company without cause following a change in control, the executive officer is entitled to participate in certain benefit plans provided by the Company for the remainder of the applicable employment period and receive an amount equal to the base salary through the date of termination and for the remaining portion of the applicable employment period, all deferred salary and other compensation earned by the executive officer during the course of employment with the Company and the amount of the target cash incentive bonus under all short-term and long-term cash bonus plans maintained by the Company in which the executive officer participates for the fiscal year of termination and for all subsequent fiscal years through the applicable employment period. Upon the executive officer’s termination of employment by the surviving entity without cause, or by the officer for good reason, in either case within 24 months (36 months in the case of the Chief Executive Officer) following a change in control, all of the executive officer’s equity-based awards that are in effect as of the date of such termination will be vested in full or deemed earned in full (as if the maximum performance goals provided under such award were met, if applicable) effective on the date of such termination (i.e., a “double trigger”); if employment continues, the original vesting schedule will continue to apply. To the extent that equity-based awards are not assumed by the purchaser, successor or surviving entity, or a more favorable outcome is not provided in the applicable plan or award agreement, upon a change in control: (i) stock options, stock-appreciation rights and time-based restricted stock (including restricted stock units) will vest and may be paid out in cash; (ii) performance-based awards will be pro-rated and paid out in cash assuming the greater of target or projected actual performance (based on the assumption that the applicable performance goals continue to be achieved at the same rate through the end of the performance period as they have been at the time of the change in control); (iii) dividend equivalent units will be pro-rated to the extent, if at all, any related award is settled on a pro rata basis and paid out in cash; and (iv) each other type of equity-based award not mentioned above will be paid out in cash based on the value of the award as of the date of the change in control. In the event the executive officer is terminated by the Company for cause, the executive officer is only entitled to the salary and benefits accrued and vested as of the effective date of the termination. Except as described below, each Contingent Employment Agreement is terminable by either party at any time prior to a change in control. If a named executive officer is terminated by the Company without cause within six months prior to a change in control and it is reasonably demonstrated by the executive officer that the termination (i) was at the request of a third party who has taken steps reasonably calculated to effect a change in control; or (ii) otherwise arose in connection with or in anticipation of a change in control, the executive officer will be entitled to the severance payment and benefits that he would have otherwise have received if he were terminated by the Company without cause following a change in control. If any of the payments to a named executive officer would constitute an “excess parachute payment” under Section 280G of the Internal Revenue Code and would result in the imposition on the executive officer of an excise tax under Section 4999 of the Internal Revenue Code (the “Excise Tax”), the executive officer is not entitled to any tax gross up amount; however, the executive officer would be entitled to receive the “best net” treatment. Under the “best net” treatment, if the after-tax amount (taking into account all federal, state and local excise, income and other taxes) that would be retained by the executive officer is less than the after-tax amount that would be retained by the executive officer if the executive officer were instead to be paid or provided (as the case may be) the maximum amount that the executive officer could receive without being subject to the Excise Tax (the “Reduced Amount”), then the executive officer shall be entitled to receive the Reduced Amount instead of the full amount that would have been subject to the Excise Tax. The Contingent Employment Agreements also provide that if the executive officer is terminated (i) by the Company without cause prior to the end of the applicable employment period; or (ii) by the Company within six months prior to a change in control in anticipation of a change in control as explained above, the executive officer will be prohibited from rendering services to a competitor of the Company for (y) the lesser of two years (three years in the case of the Chief Executive Officer) or the unexpired term of the applicable employment period or (z) two years (three years in the case of the Chief Executive Officer) in the case of a termination by the Company within six months prior to a change in control in anticipation of a change in control as described above. The Contingent Employment Agreements define “competitor” as any corporation, person, firm or organization that engages in research and development work, produces and/or sells any product or service that is the same as, functionally equivalent to, or otherwise directly competitive with one made, offered, sold or provided by the Company. The Contingent Employment Agreements define “cause” as a conviction based upon the commission of a felony or becoming the subject of a final nonappealable judgment of a court of competent jurisdiction holding that the executive officer is liable to the Company for damages for obtaining a personal benefit in a transaction adverse to the interests of the Company. The Contingent Employment Agreements define “good reason” as a material diminution in position, authority or title, or the assignment of duties that are materially inconsistent with the executive officer’s position or title as described in the applicable Agreement; a material diminution in base salary or incentive/bonus opportunities; a change of fifty miles from the location of the executive officer’s principal place of employment on the date of the change in control; a material breach by the Company of any of its obligations under the applicable Agreement; and any successor to the principal business of the Company failing or refusing to assume the Company’s obligations under the applicable Agreement. If the executive officer becomes disabled during the applicable employment period and is unable to perform the regular duties of employment on a full-time basis, the Company will pay the executive officer’s normal salary and benefits for the first six months. If the disability continues beyond six months, the executive officer’s normal salary will be suspended during the period of disability. The executive officer will continue to be eligible for customary benefits as provided by the Company during the term of the executive officer’s disability and until the expiration of the applicable employment period. The following table presents the estimated payouts that would be made upon a change in control coupled with a termination of employment (other than for cause or retirement), assuming the change in control occurred as of December 31, 2018. Represents three times Mr. Pennypacker’s and two times each of the other named executive officer’s base salary on December 31, 2018. Represents three times Mr. Pennypacker’s and two times each of the other named executive officer’s target cash incentive compensation under the 2018 STIP. As of December 31, 2018, all stock option exercise prices for the stock options held by the named executive officers were above the closing price ($14.77) of the Company’s common stock on December 31, 2018. Represents the value of vested and unvested restricted stock units and restricted shares based on the closing price ($14.77) of the Company’s common stock on December 31, 2018. Represents the value of (a) performance shares for the 2016-2018 performance cycle, which were earned at approximately 40.5% of target, and (b) other unvested performance shares, prorated and based on performance at year-end, which for the 2017-2019 performance cycle is projected above threshold and is shown at 100% of target and for the 2018-2020 performance cycle is projected above threshold and is shown at 100% of target. These values are based on the closing price ($14.77) of the Company’s common stock on December 31, 2018. Represents three times in the case of Mr. Pennypacker and two times in the case of each of the other named executive officers, the value of annual benefits (including group life insurance, hospitalization and medical insurance) provided to such named executive officer. The Company does not provide excise tax gross-ups under the Contingent Employment Agreements. As stated in the Compensation Discussion and Analysis, the Company also has a severance pay plan that establishes a discretionary severance program across the Company whereby all severance benefits are provided at the Company’s sole discretion and will be designed to meet the specific facts and circumstances of each termination. The Board of Directors and the Compensation Committee have the sole authority to authorize any benefits under the plan to any officer of the Company. Other than this discretionary severance pay plan, the Company does not generally have a formal severance plan for other forms of employment termination, except for the Contingent Employment Agreements described under Post-Employment Compensation. the annual total compensation of Mr. Pennypacker was $5,086,182. Based on this information, the ratio of the annual total compensation of our Chief Executive Officer to the annual total compensation of our median employee is estimated to be 91 to 1. We identified our median employee using a multi-step process. First, we examined the base salaries and wages of all individuals employed by us on December 31, 2018 (other than Mr. Pennypacker), whether full-time, part-time, or on a seasonal basis to identify the median base salary of all our employees. We annualized wages and salaries for all permanent employees who were hired after January 1, 2018, as permitted by SEC rules, and converted all employees’ salaries or wages into U.S. dollars based on the applicable foreign exchange rate on December 31, 2018. We then calculated the total compensation of each of the employees to whom we paid the median base salary according to the same rules we use to calculate the total compensation of our named executive officers reported in the Summary Compensation Table, which did not include the value of widely available welfare benefits. We selected the individual within such group whose total compensation was at the median to serve as our median employee whose compensation is disclosed above. To calculate our ratio, we divided Mr. Pennypacker’s annual total compensation by the annual total compensation of our median employee. To calculate Mr. Pennypacker’s annual total compensation, we used the amount reported in the “Total” column of our Summary Compensation Table for 2018. Management knows of no business that will be presented for action at the 2019 Annual Meeting other than as set forth in the Notice of Annual Meeting accompanying this Proxy Statement. If other matters do properly come before the 2019 Annual Meeting, proxies will be voted in accordance with the best judgment of the person or persons exercising authority conferred by such proxies. Proposals that shareholders of the Company intend to present at and have included in the Company’s Proxy Materials for the 2020 Annual Meeting of Shareholders pursuant to Rule 14a-8 under the Securities Exchange Act of 1934, as amended (“Rule 14a-8”), must be received no later than November 29, 2019, at the Company’s principal executive offices, One Park Plaza, 11270 West Park Place, Suite 1000, Milwaukee, Wisconsin 53224, directed to the attention of our Secretary. Under the Company’s Restated By-laws, written notice of shareholder proposals for the 2020 Annual Meeting of Shareholders of the Company that are not intended to be considered for inclusion in the 2020 Annual Meeting Proxy Materials (shareholder proposals submitted outside the processes of Rule 14a-8) must be received not prior to January 13, 2020 nor after February 7, 2020, directed to the attention of our Secretary, and such notice must contain the information specified in the Company’s Restated By-laws. A copy (without exhibits) of the Company’s Annual Report to the Securities and Exchange Commission on Form 10-K for the fiscal year ended December 31, 2018 is available online at www.proxyvote.com and also through the Company’s website: www.manitowoc.com. In addition, the Company will provide to any shareholder, without charge, upon written request of such shareholder, an additional copy of such Annual Report and a copy of any other document referenced in this Proxy Statement as being available to a shareholder upon request. Such requests should be addressed to our Secretary, The Manitowoc Company, Inc., One Park Plaza, 11270 West Park Place, Suite 1000, Milwaukee, Wisconsin 53224. We have adopted a procedure approved by the SEC called “householding.” Under this procedure, shareholders of record who have the same address and last name and do not participate in electronic delivery of Proxy Materials will receive only one copy of our Annual Report and Proxy Statement unless one or more of these shareholders notifies us that they wish to continue receiving individual copies. This procedure will reduce our printing costs and postage fees. Shareholders who participate in householding will continue to receive separate proxy cards. Also, householding will not in any way affect any dividend check mailings. If you and other shareholders of record with whom you share an address currently receive multiple copies of Annual Reports and/or Proxy Statements, or if you hold stock in more than one account and in either case, you wish to receive only a single copy of the Annual Report or Proxy Statement for your household, please contact our Secretary (in writing: The Manitowoc Company, Inc., One Park Plaza, 11270 West Park Place, Suite 1000, Milwaukee, Wisconsin 53224, by telephone: 920-684-4410) with the names in which all accounts are registered. If you participate in householding and wish to receive a separate copy of the 2018 Annual Report or this Proxy Statement, please contact our Secretary at the above address or phone number. We will deliver the requested documents to you promptly upon your request. Beneficial shareholders can request information about householding from their banks, brokers, or other holders of record. It is important that proxies be returned promptly. Whether or not you expect to attend the 2019 Annual Meeting in person, you are requested to complete, date, sign, and return the proxy card as soon as possible. Section 4.2. Removal of Directors. A director may be removed from office if the number of votes cast for removal exceed the number of votes against it, assuming a quorum is present, by affirmative vote of two-thirds (2/3) of the outstanding shares entitled to vote for the election of such director, taken at a meeting of shareholders called for that purpose, and any vacancy so created may be filled by such shareholders. The reconciliation provided below reconciles free cash flow with non-GAAP adjusted operating cash flow for the year ended December 31, 2018. In addition, a reconciliation of non-GAAP adjusted operating cash flow to Net cash used for operating activities (the most directly comparable GAAP financial measure) is included in Item 7. “Management’s Discussion and Analysis of Financial Condition and Results of Operations” (on page 34) of the Company’s Annual Report on Form 10-K for the year ended December 31, 2018.